DALLAS — The Virginia men’s basketball program is back in the Final Four for the first time in 35 years. Amongst the UVA alums who seems the proudest is Dallas Mavericks coach Rick Carlisle. 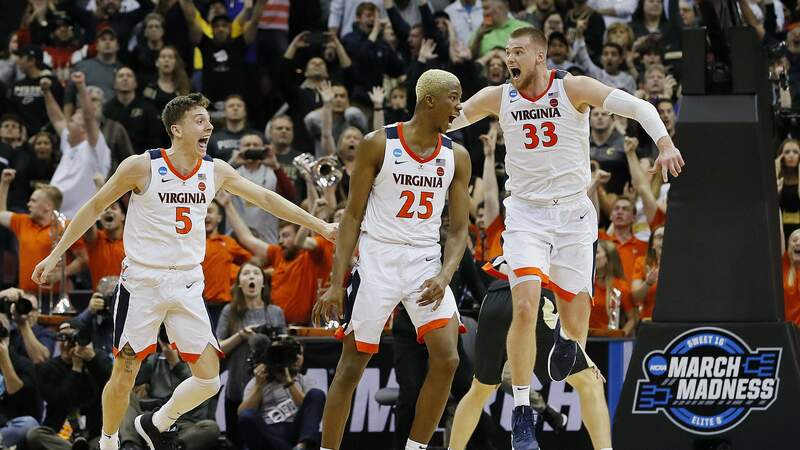 Prior to Friday night’s game versus the Memphis Grizzlies in the American Airlines Center, Carlisle spoke of how delighted he is to witness Virginia atone for last year’s NCAA Tournament’s first-round exit by reaching the national semifinals. The champions out of the South Region, the top-seeded Cavaliers (33-3) will face Midwest Region champion, fifth-seeded Auburn (30-9), Saturday at 5:09 p.m. CST from U. S. Bank Stadium in Minneapolis. The second national semifinal matchup will pit No. 3 seed Texas Tech (30-6), the West Region champion, squaring off against East Region champion, No. 2 seed Michigan State (32-6). For UVA, which became the first ever No. 1 seed to lose to a No. 16 seed when it was dealt a 74–54 drubbing by the University of Maryland-Baltimore County in last year’s opening round of the Big Dance, Carlisle applauded Cavaliers coach Tony Bennett for a job well done with a program that is making its third Final Four appearance in school history (1981, 1984, 2019). THE LAST TIME — Carlisle (left) was a member of Virginia’s 1984 Final Four squad that lost in the national semifinals to Akeem Olajuwon and No. 2 seed Houston, 49-47, in overtime. 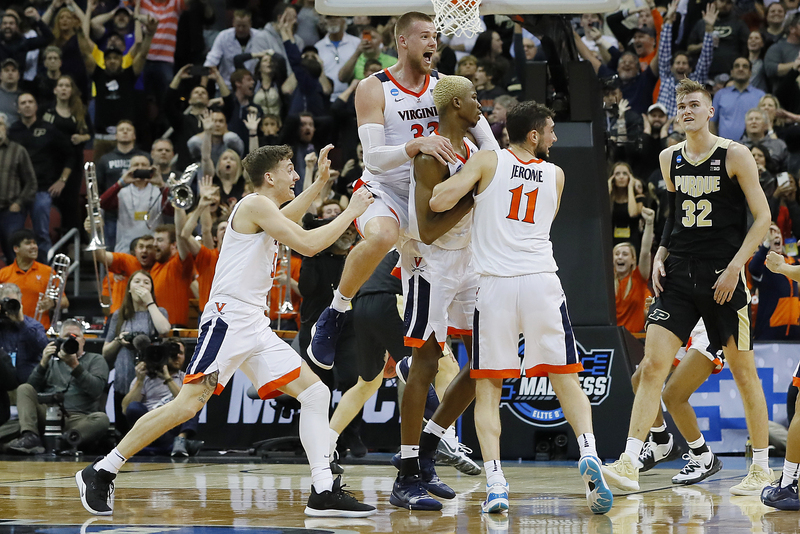 In reaching the Final Four for the first time since 1984, Virginia demonstrated some much-needed resolve in the waning moments of the South Region final against third-seeded Purdue. The Cavaliers, in fact, needed a rather awkward buzzer-beater by junior swingman Mamadi Diakite just as time expired to tie the game at 70 and force overtime, then outscored the Boilermakers, 10-5, in the extra session to preserve the win, thus erasing the memory of last year’s opening-round heartbreaker to UMBC. According to ESPN’s Matchup Predictor, Virginia has a 79.9 percent chance of defeating Auburn, which is making its first Final Four appearance in school history. Michigan State, meanwhile, has a 61.1 percent chance to upend Texas Tech, according to ESPN’s Matchup Predictor. As for who Carlisle’s predicting to win the first of two national semifinal games, well, that essentially goes without saying. PRAYER ANSWERED — The Cavaliers needed a buzzer-beater by junior swingman Mamadi Diakite just as time expired to tie the game at 70 and force overtime, then outscored the Boilermakers, 10-5, in the extra session to preserve the win, erasing the memory of last year’s opening-round heartbreaker to UMBC. According to ESPN’s Matchup Predictor, UVA has a 79.9 percent chance of defeating Auburn, which is making its first Final Four appearance in school history. Now that they’ve atoned for last year’s postseason disappointment, can the grit and grind Cavaliers manage two more wins to capture the school’s first ever national title? 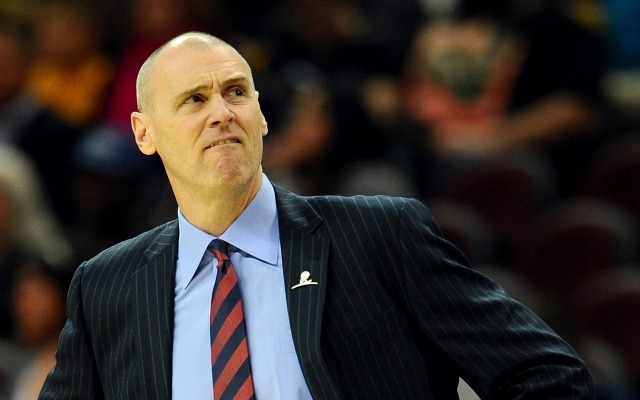 “They’ve got a real chance now,” Carlisle said. That, much to his delight and to the satisfaction of the rest of the UVA faithful, is a far cry from last year’s disastrous turn of events in the Big Dance. 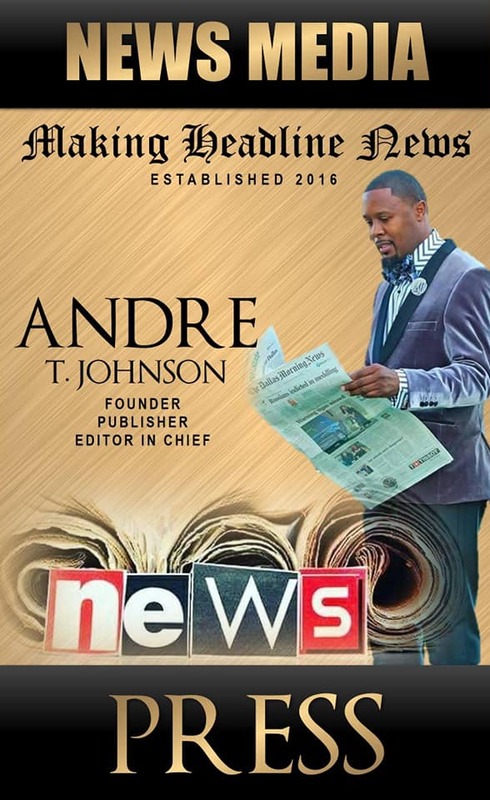 Andre Johnson is the award-winning Founder/Publisher & Editor In Chief of Making Headline News. 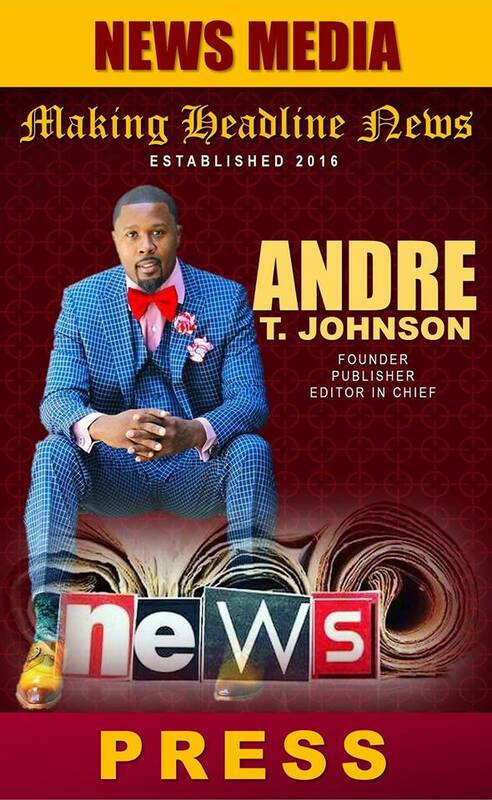 A 2000 graduate of the University of Memphis School of Journalism and a former reporter of sports for the Memphis Commercial Appeal newspaper, Johnson covers the NBA Southwest Division from Dallas, Texas. 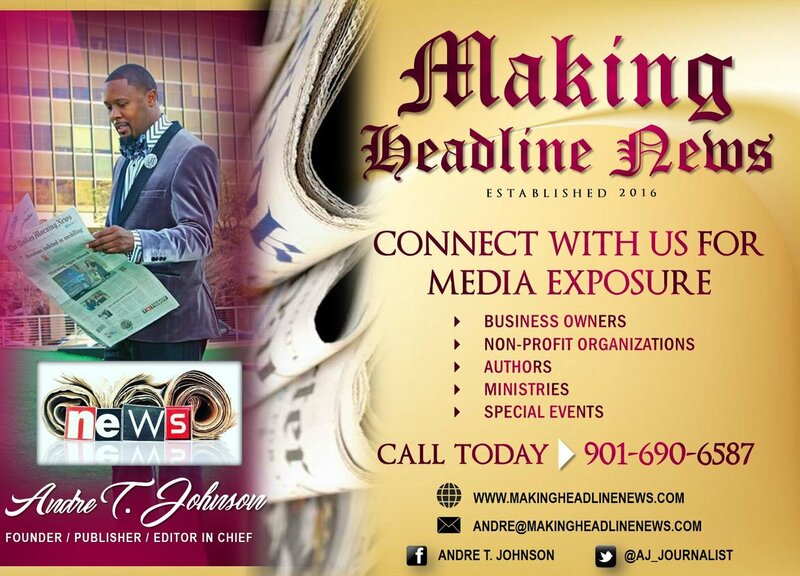 To reach Johnson, call him at 901-690-6587 or send email to andre@makingheadlinenews.com. Also, follow him on Twitter @AJ_Journalist. 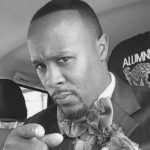 MAJOR MAJOR STRIDES — A native of Oklahoma City, Karim Muhammad is especially grateful of the immeasurable strides he made through his Teachers Appreciation Foundation, which is steadily attracting more of a national presence. DALLAS — Karim Muhammad is on a mission. A great, big one, to be more technical. Consider, for instance, Muhammad’s fervent, unyielding quest in having a monumental impact as the founder and executive director of the Teachers Appreciation Foundation, his Oklahoma City-based nonprofit organization he founded nearly five years ago. “Inspiring others is very instrumental (in that I’m afforded the golden opportunity) to encourage them to follow their dreams,” Muhammad told Making Headline News during a weekend interview. A native of Oklahoma City, Muhammad is especially grateful of the immeasurable strides he’s made through his organization, which is steadily attracting more of a national presence. So much, in fact, that this young businessman doesn’t shy away from the notion that he’s destined to devise ways to grasp the attention of a few renowned celebrities and political figures. “Our goal is to convey the mission and the message on a national talk show and syndicated radio talk show,” said Muhammad, referring specifically to the Steve Harveys, Wendy Williamses, Dr. Phils, and the Rickey Smileys of the world, just to name a few. A former Langston University and Oklahoma State University student, Muhammad’s Teachers Appreciation Foundation is comprised of a five-person leadership board in which his mother serves as President. 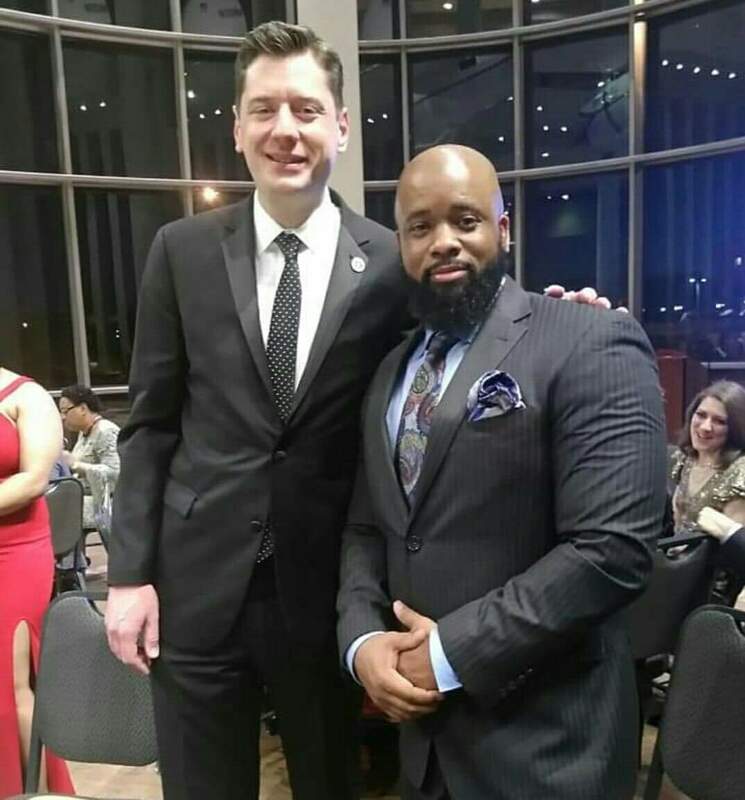 Pictured with Muhammad is Oklahoma City Mayor David Holt. 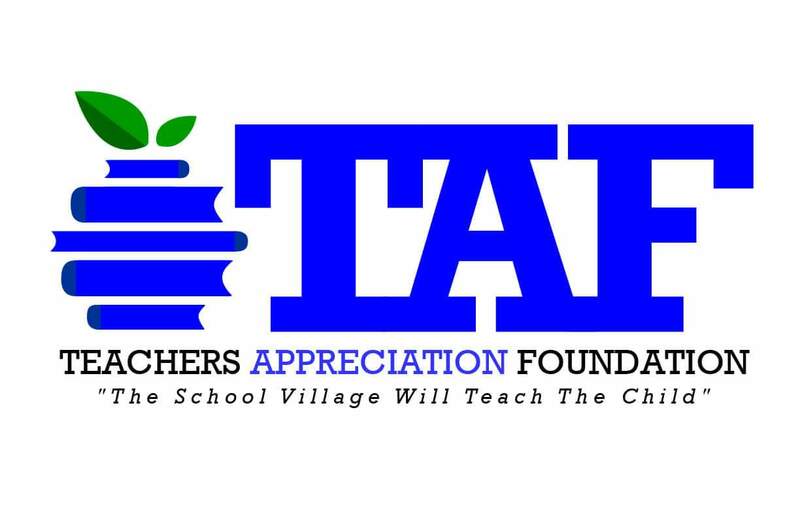 A nonprofit organization that went into full operations in June 2014, Teachers Appreciation Foundation’s mission is centered largely on remaining dedicated to the movement of appreciating the school village responsible for teaching the future leaders of the world, as mentioned in a detailed breakdown of this institution at https://www.taf5.org/. Moreover, this credible nonprofit is widely known for giving back to Oklahoma schools by acknowledging and appreciating educators and support workers in a big way. Powered by the motto, “The School Village Will Teach The Child” — a catchphrase that was spearheaded by Muhammad’s mother, former longtime educator Miniimah Muhammad — Muhammad was determined to start a foundation that honors school teachers, custodians, school bus drivers, cafeteria workers, and everyone involved in the school system as a whole, he said. 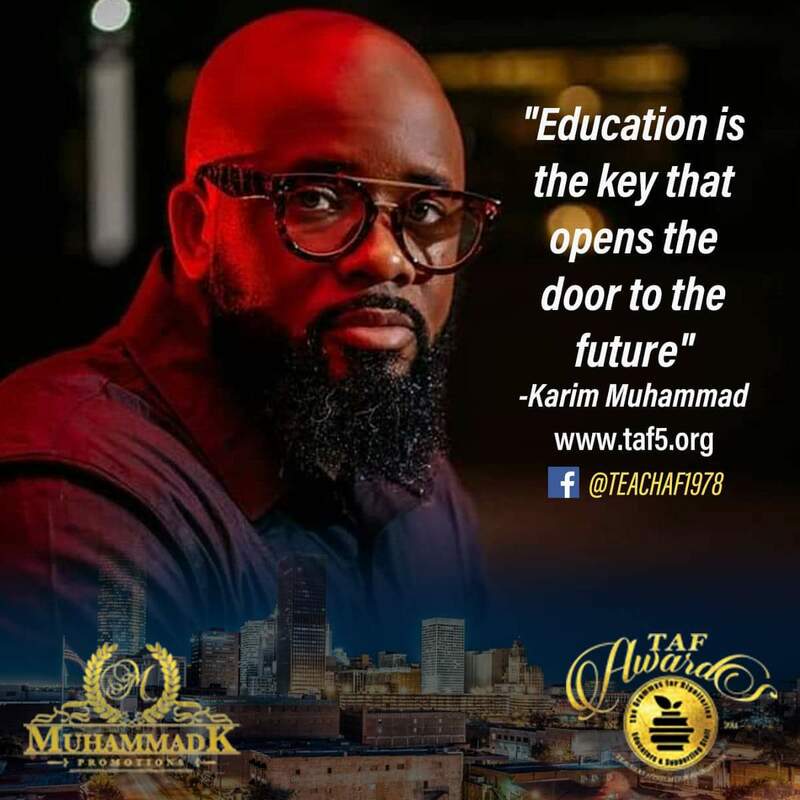 Nearing its fifth year of existence, Teachers Appreciation Foundation has become a fixture, particularly in highlighting what Muhammad describes as “the roots of these phenomenal people” in large part because “they are pieces to the educational puzzle,” he said. Interestingly and to his credit, Muhammad’s mother — whose teaching career spanned more than three decades — were amongst those elated and enthused about the concept to establish a credible and worthy foundation. Much to his delight, social media has benefited Muhammad’s organization mightily in that it has helped spread the word about his flourishing endeavor, which will be hosting its annual TAF Awards Show in the coming months. 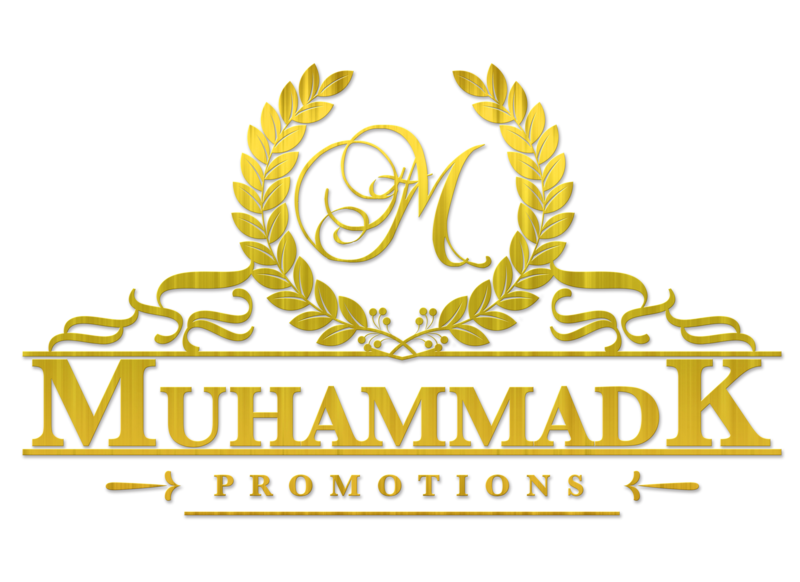 According to Muhammad, he and his staff are in discussion for the 2020 TAF Awards to be held in Oklahoma City (February 1 of that year) and nearby Arlington, Texas (on February 8). 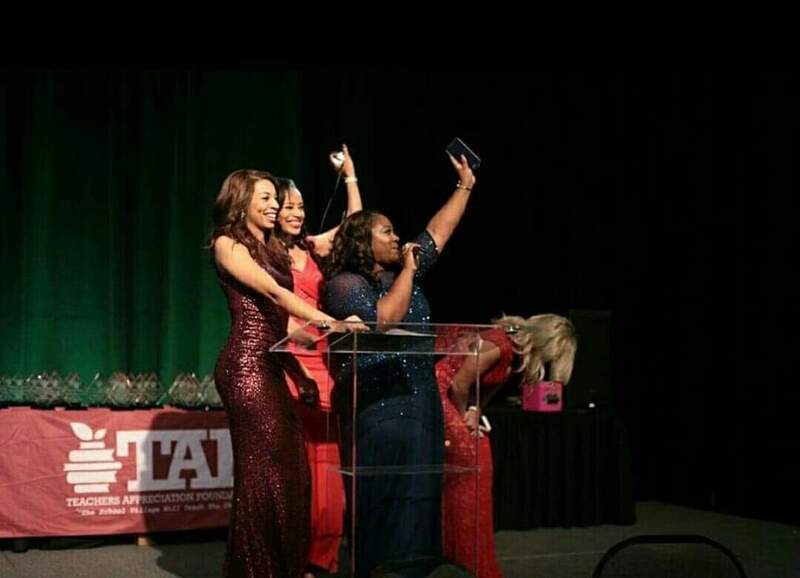 In addition, his organization will be hosting a number of community-related events, most notably its TAF Awards Sponsorship Seminars, which customarily take place the third Thursday of each month and is free and open to the public. A former Langston University and Oklahoma State University student, Muhammad’s Teachers Appreciation Foundation is comprised of a five-person leadership board in which his mother serves as President. Dawud Ali is TAF’s Vice President, Moneka Sharee is Secretary, and Julie Sharif and Latasha Howell assume the roles as staff members. Powered by the motto, “The School Village Will Teach The Child” — a catchphrase that was spearheaded by Muhammad’s mother, former longtime educator Miniimah Muhammad — Muhammad was determined to start a foundation that honors school teachers, custodians, school bus drivers, cafeteria workers and everyone involved in the school system as a whole. Talk about a man on a mission. 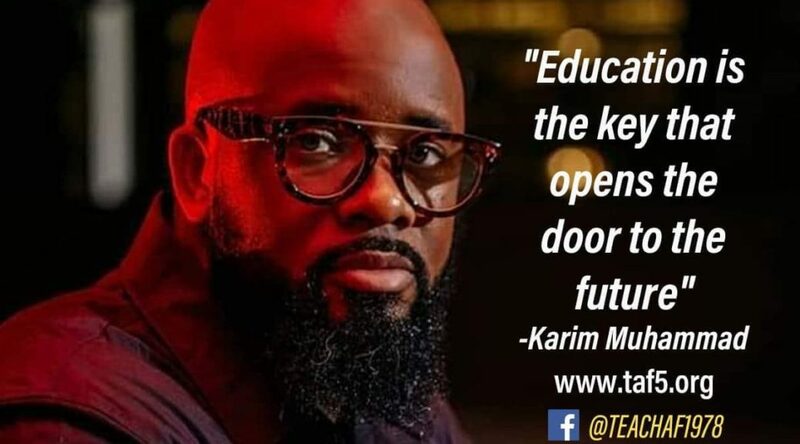 For more information about Oklahoma City-area Businessman Karim Muhammad, or to schedule him for a public appearance or speaking engagement, call 405.532.3488 or write to: P.O. Box 17613, Oklahoma City, Oklahoma 73136. 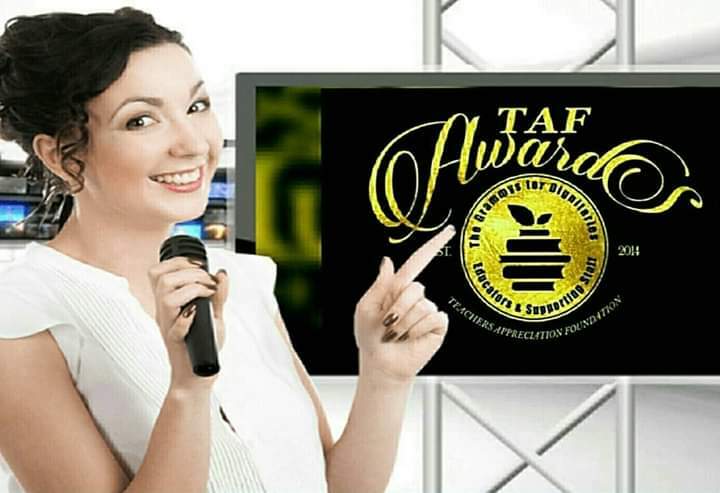 Also, connect with TAF via Facebook at: https://www.facebook.com/teachAF1978/. Also, send email to: tafteam5@gmail.com. 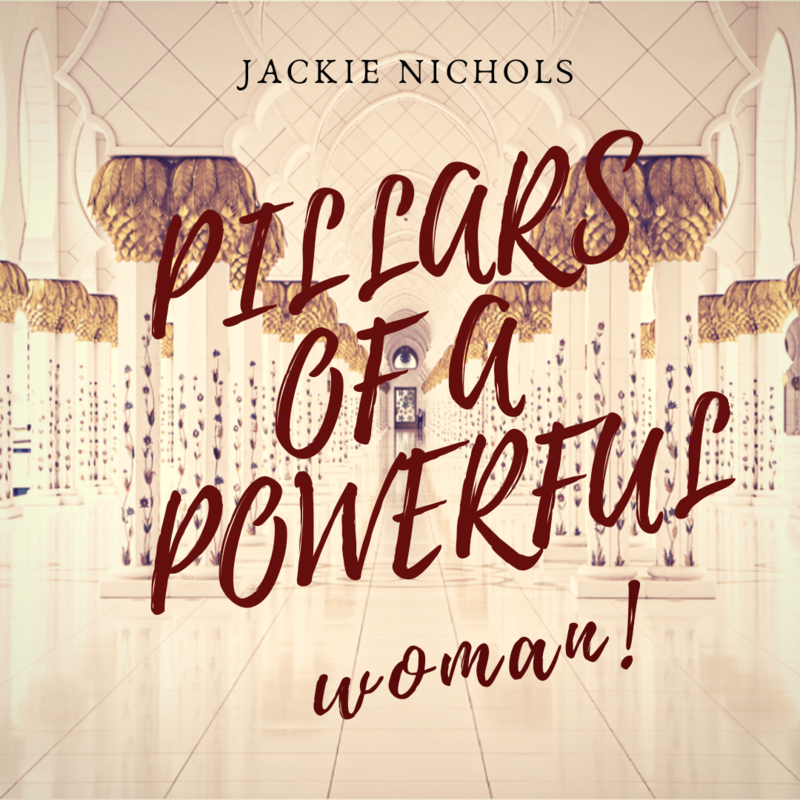 REAPING A HARVEST — A native of the Windy City, Jackie Nichols Anderson is the mastermind behind her remarkably compelling project entitled, “Pillars Of A Powerful Woman,” a book that officially hit the market earlier this year — this after she needed just a few months to compose it. DALLAS — Sometime after 9 o’clock CST Tuesday night, Jackie Nichols Anderson was taking questions from the media. She was all smiles, too. “If you could see the huge smile on my face right now,” Nichols Anderson told Making Headline News, referring to the media coverage surrounding her newly-produced book. For Nichols Anderson, a Chicago-based writer, the prelude to her delving off into the ever-so-competitive world of authorship is an awe-inspiring memory she undoubtedly will share for the rest of her life. 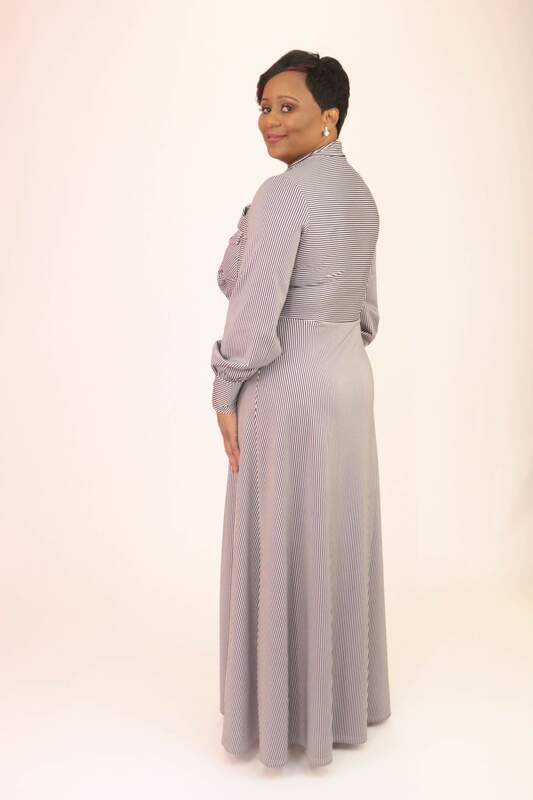 A book that is will soon be available for purchase online at Amazon and Barnes and Noble, “Pillars Of A Powerful Woman” is currently available for purchase at Nichols Anderson’s website at: https://www.thevisionvoicevalue.com/. 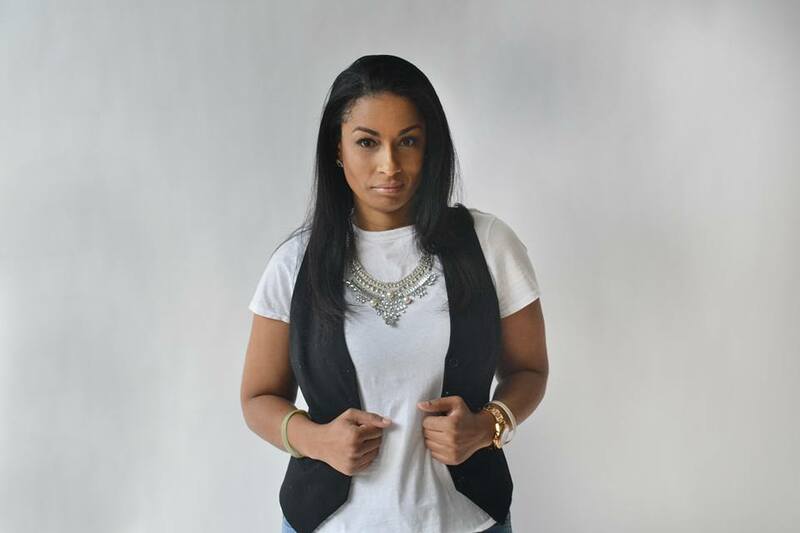 A native of the Windy City, Nichols Anderson is the mastermind behind her remarkably compelling project entitled, “Pillars Of A Powerful Woman,” a book that officially hit the market earlier this year — this after she needed just a few months to compose it. GOD’S BEACON OF LIGHT — All things considered, Nichols Anderson is hopeful her pivotal eating habits will inspire others to follow suit — and, of course, purchase her new book, which details her life-altering testimonies. Nichols Anderson’s “Pillars Of A Powerful Woman” comes amid her 2015 diagnosis with multiple sclerosis. 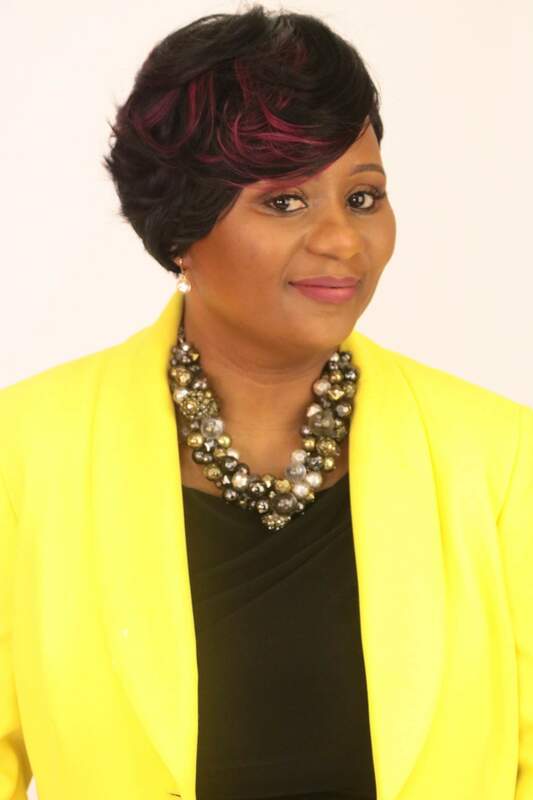 An accomplished businesswoman in her own right, Nichols Anderson is overwhelmingly grateful to her Creator for providing her with the much-anticipated breakthrough she needed, both in the natural and the spirit. Especially in the natural, she acknowledged. “(The) divine message is the fruit of the spirit is what makes a person or woman powerful, retaining and implementing with God has giving to us to be the reflection of Him, to carry out purpose, goals, and plans in life,” Nichols Anderson said. 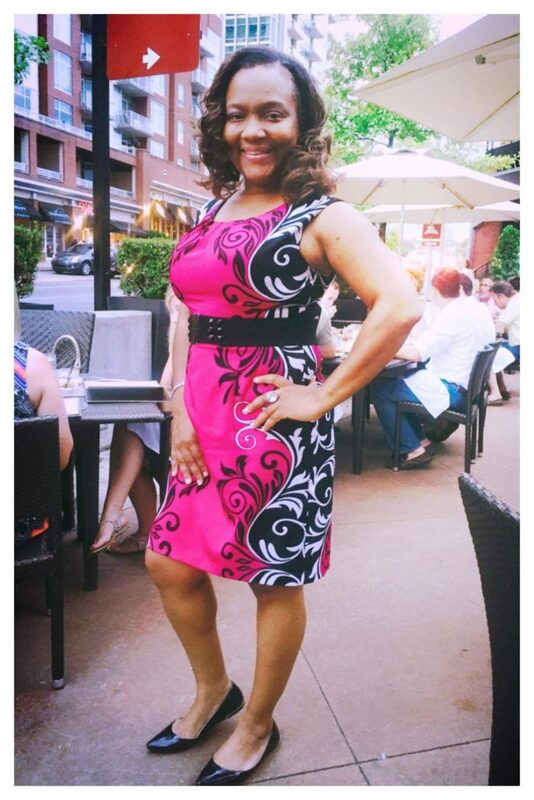 A book that will soon be available for purchase online at Amazon and Barnes and Noble, “Pillars Of A Powerful Woman” is currently available for purchase at Nichols Anderson’s website at: https://www.thevisionvoicevalue.com/. “As a counselor, these are the techniques used in counseling, creating coping mechanisms, as well as helping them transform to the best version of themselves,” Nichols Anderson said her new book. GOD’S PLAN — An accomplished businesswoman in her own right, Nichols Anderson is overwhelmingly grateful to her Creator for providing her with the much-anticipated breakthrough she needed, both in the natural and the spirit. All things considered, Nichols Anderson is hopeful her pivotal eating habits will inspire others to follow suit — and, of course, purchase her new book, which details her life-altering testimonies. Talk about leading by example. If only you could see the huge smile on her face right now. 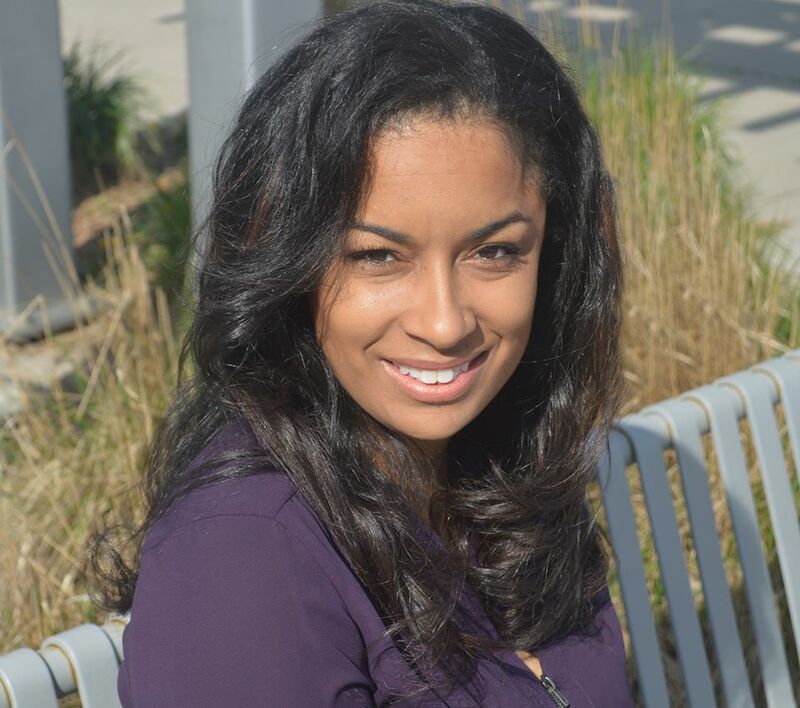 For the record, Alisha B. Allen could be what one would appropriately describe as a serial entrepreneur. Or perhaps a businesswoman of many hats. On second thought, perhaps she could tell it best. “Multi-business owner,” Allen told Making Headline News this week. 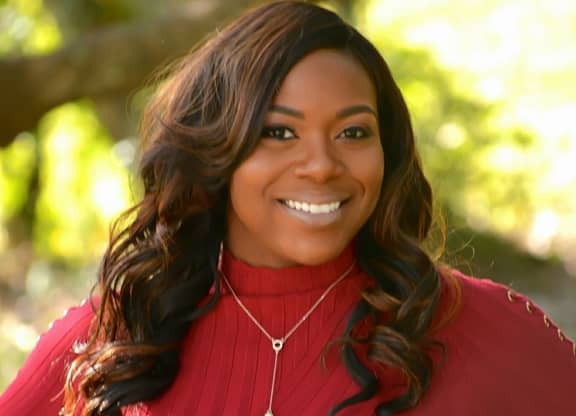 DESTINY STEPS — Armed with a Master’s Degree in Business Administration from Purdue University, North Carolina entrepreneur Alisha Allen oversee an assortment of business ventures, as Founder and CEO of ABA Enterprises. Indeed she is. And, to her distinctly unique credit, she’s doing a masterful job of juggling multiple endeavors, all the while walking in her divine purpose in the process. Armed with a Master’s Degree in Business Administration from Purdue University, Allen oversees an assortment of business ventures as Founder and CEO of ABA Enterprises. Based in her native establishment of Monroe, North Carolina, Allen is a fixture for a credit resolution company that centers largely on consumer credit education by offering financial workshops, as well as communication on how to increase credit scores, budgeting, and other financial literacy education. IN HIGH PLACES — To her credit, it seems that Allen’s wealth of entrepreneurship experience has been recognized and applauded in various places around the country, most notably Albuquerque, New Mexico, St. Louis, Florence, South Carolina, Dallas, Charlotte, as well as the North Carolina cities of Monroe, Wadesboro, and Albemarle.. 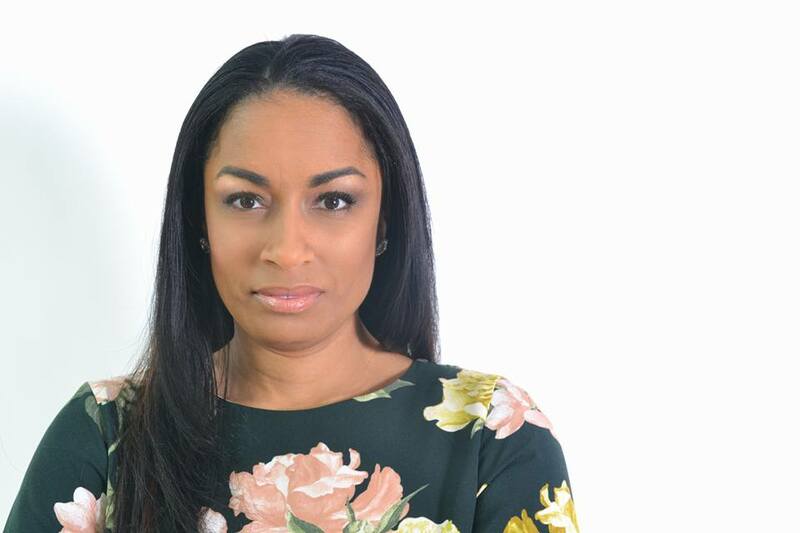 In addition, she is the mastermind of Alisha Allen Realty, whereby she serves as a licensed real estate broker. Her chief responsibilities include — but aren’t limited to — helping individuals sell, buy, or invest in real estate. 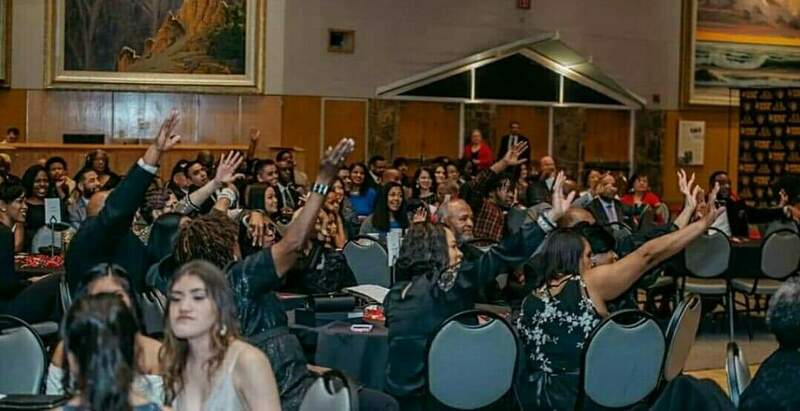 And there is “Wake Up & Win,” which Allen’s thriving, progressive ministry that is centered mostly on encompasses financial literacy, home ownership, and business concepts with inspiration by way of speaking engagements, webinars, and church or civic organization events. In essence, Allen assumes the role as an inspirational speaker through this endeavor. 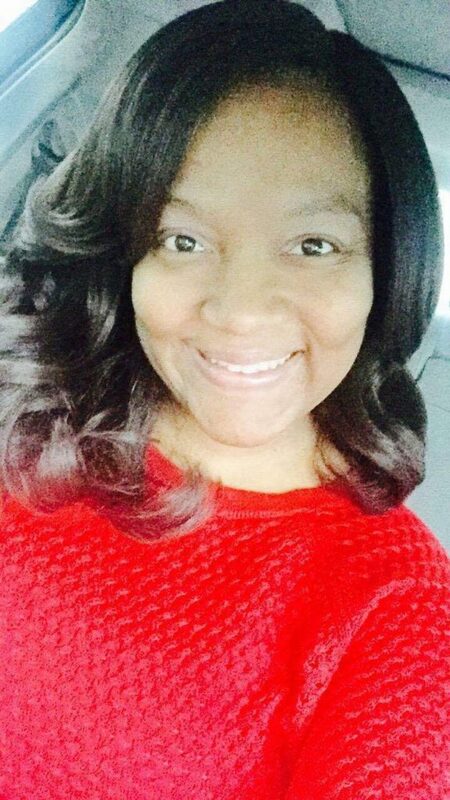 A graduate of Monroe (North Carolina) High School, who’s currently enrolled in Apex School of Theology, where she’s pursuing Master of Divinity, Allen acknowledged that it is due in large part to her life’s competitive drive that has greatly empowered her to gain the essential insight needed to make her dreams a reality. To her credit, it seems that Allen’s wealth of entrepreneurship experience has been recognized and applauded in various places around the country, most notably Albuquerque, New Mexico, St. Louis, Florence, South Carolina, Dallas, Charlotte, as well as the North Carolina cities of Monroe, Wadesboro, and Albemarle. All of which explains why she could be what one would appropriately describe as a serial entrepreneur. Allen is an accomplished author, having assembled one book (True Credit Restoration Journal) and two journals (30 Day Money Journal and ABA Enterprises Notary Journal) with a second book release scheduled for May 2019. “(My mission is) to do my part in building stronger individuals, families, and communities so that my work, purpose, and assignment here on earth are consistently being completed,” Allen said. A business-related repertoire that spans more than two decades, Allen will be afforded the golden opportunity to promote her brands during public appearances in in nearby Charlotte April 13 and May 4. 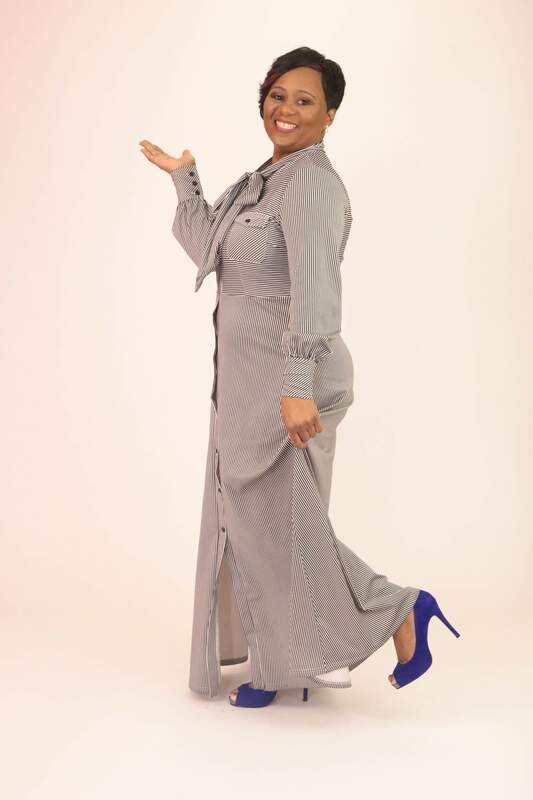 Interestingly, she’s a licensed minister, a certified credit consultant, a certified notary public instructor, and is an ambassador in Monroe and the surrounding areas as a community activist, whereby she facilitates fundraising. 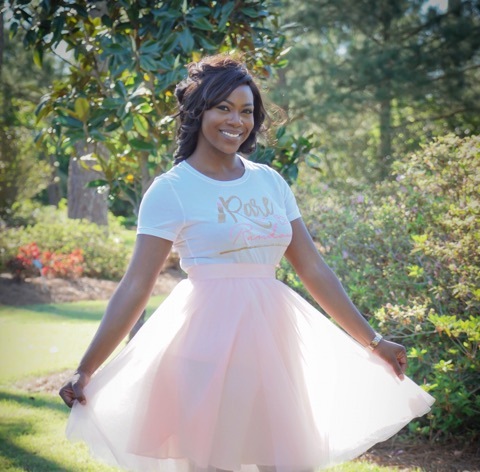 WOMAN OF EMPOWERMENT — A graduate of Monroe (North Carolina) High School, who’s currently enrolled in Apex School of Theology, where she’s pursuing Master of Divinity, Allen acknowledged that it is due in large part to her life’s competitive drive that has greatly empowered her to gain the essential insight needed to make her dreams a reality. 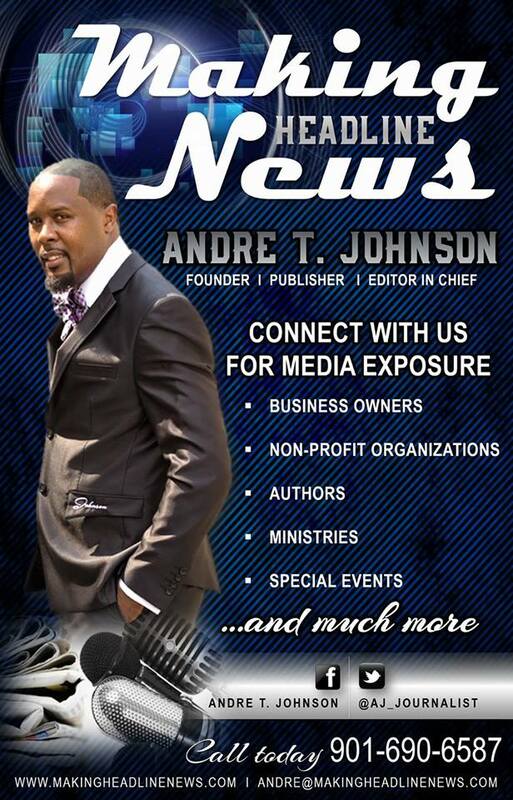 Also, Allen is an accomplished author, having assembled one book (True Credit Restoration Journal) and two journals (30 Day Money Journal and ABA Enterprises Notary Journal) with a second book release scheduled for May 2019. Well said by a woman, who could be what one would appropriately describe as a serial entrepreneur. On second thought, she’s already said it best. 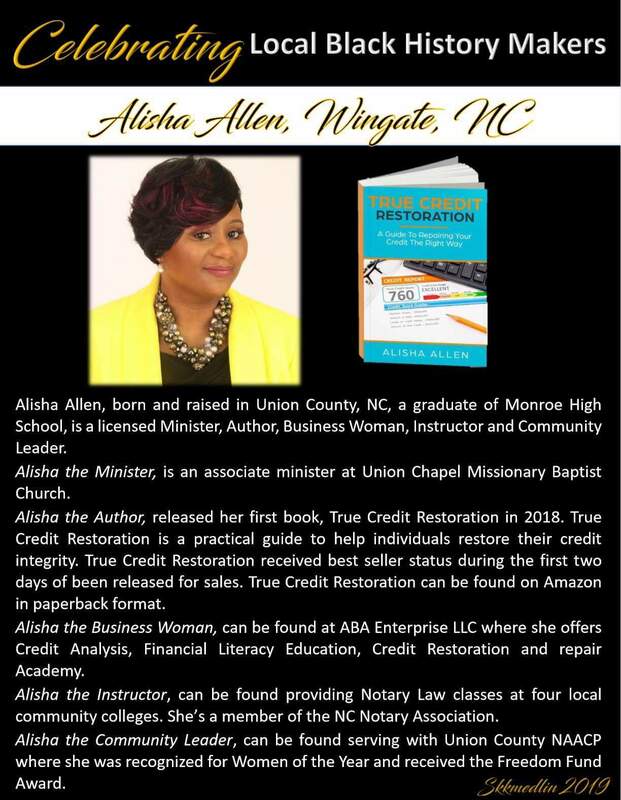 For more information about Monroe, North Carolina-area Businesswoman Alisha Allen of ABA Enterprises, or to schedule her for a public appearance, a book signing or speaking engagement, connect with her via Facebook at: https://www.facebook.com/SpecialKindaLady. Also, send email to: alisha@abaenterprise.com. 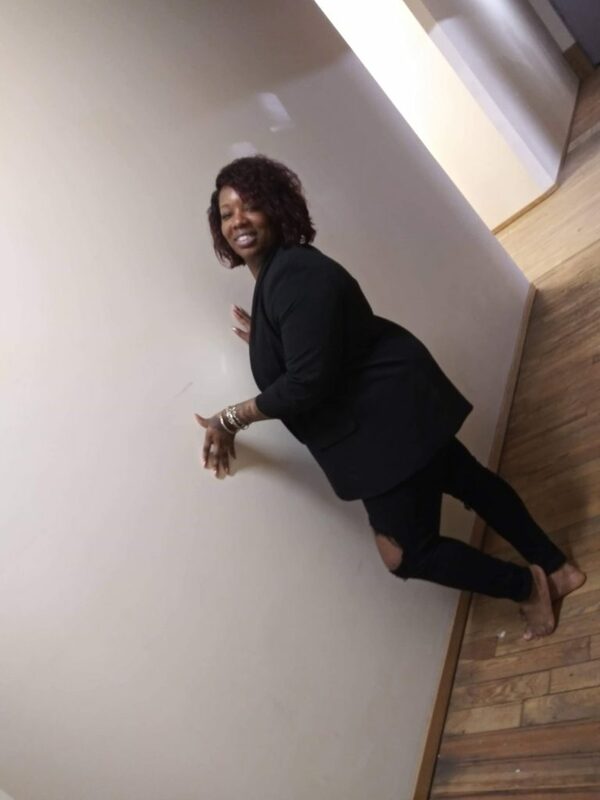 DALLAS — Just before 10 p.m. CST on Sunday, Tamica Ross took to her Facebook page, where she shared with the masses a rather spirited, blissful announcement. Said Ross to her gallery of social media followers: Hello FB Friends and Family! 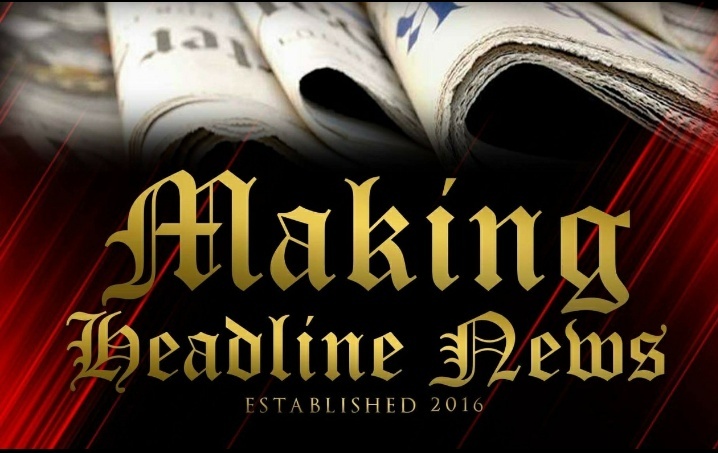 I am so excited to announce my upcoming news article. I’m making headlines. Thanking God for this awesome opportunity. 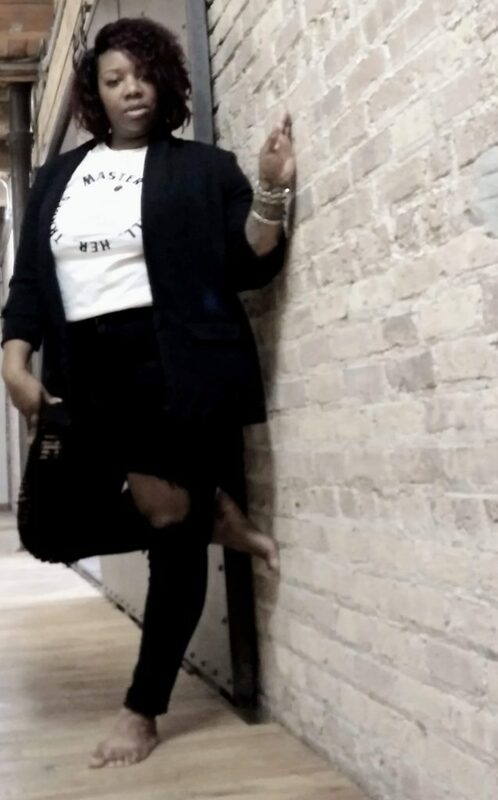 DESTINY STEPS — A native of West Tennessee — most notably the Jackson area that is housed in Madison County — Tamica Ross is the Founder and CEO of Lanese Empowerment, a Nashville-based company that is centered largely on inspiring and aiding individuals, particularly youths, as well as young adult men and women. For Ross, a Mid-South-area businesswoman, she has every right to share of some favorable news that, much to her delight, is a pivotal reminder of just how much God is using her for His glory. 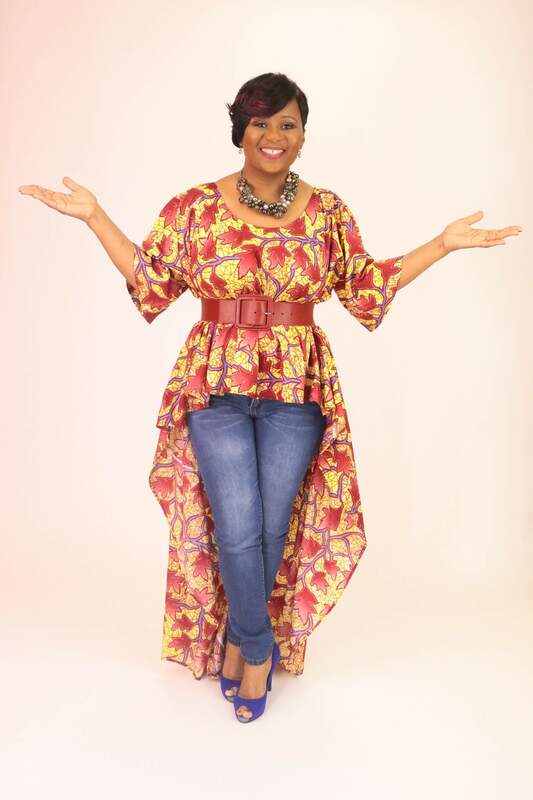 “This business was birthed by (my) own deep desires and determination to live my best life despite the challenges of growing up in an underprivileged environment, where I became a teenage mother at the age of 16 years old,” Ross, during a weekend interview with Making Headline News, said of her quest in establishing what has emerged as a credible endeavor. 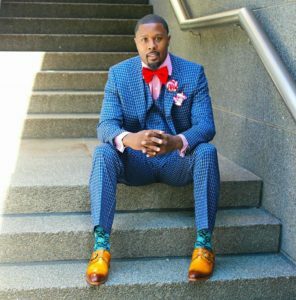 A native of West Tennessee — most notably the Jackson area that is housed in Madison County — Ross is the Founder and CEO of Lanese Empowerment, a Nashville-based company that is centered largely on inspiring and aiding individuals, particularly youths, as well as young adult men and women. As Ross specifically acknowledged, amongst her coaching venture’s strategic objectives is to empower individuals to live their best lives and, most importantly, to make all their dreams a reality. For Ross, establishing her coaching organization didn’t merely come easy. Not by a long shot. 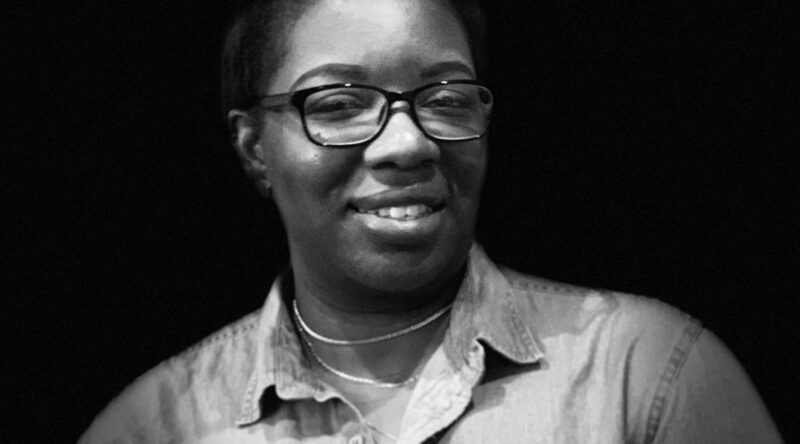 According to the Chester County High School graduate, arguably the greatest challenge she faced was attracting sustained support from people she sensed had endured similar hardships with which she once struggled. DREAMING BIG — Interestingly and to her distinctly unique credit, Ross’ venture has come full circle, courtesy of her resiliency through life coaching, free tools and resources, speaking engagements, writing books, providing scholarship funds, summer youth programs, yearly conferences for men and women, and through D.R.E.A.M.S. Not to be outdone, though, Ross’ thought process was such that if she would persevere long enough, she’d ultimately reap and possess and results she so desperately sought. The rest, as they say, was history, considering she did just that. 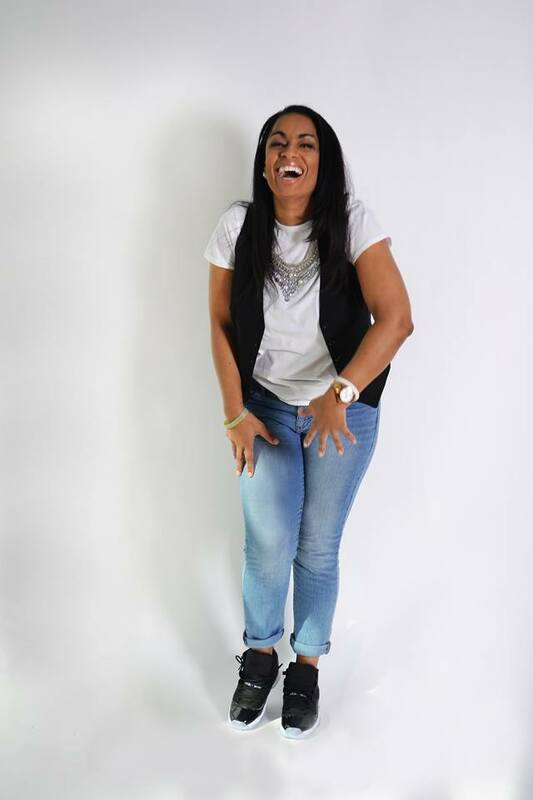 Interestingly and to her distinctly unique credit, Ross’ venture has come full circle, courtesy of her resiliency through life coaching, free tools and resources, speaking engagements, writing books, providing scholarship funds, summer youth programs, yearly conferences for men and women, and through D.R.E.A.M.S. An academy that’s comprised of a six week training program D.R.E.A.M.S. is designed to walk people through the steps needed to make any dream a reality and live their best lives one day at a time, Ross emphasized. Having resided in Nashville for the past decade-and-a-half, Ross holds a Bachelor of Science Degree in Organizational Leadership and Communication from Bethel University in McKenzie, Tennessee. Consequently, she earned a Master’s in Organizational Management from Nashville’s Belmont University. As for her coaching organization, she said such inspiration arose from the wide counsel of her mother, whom she says was “strong enough” to beat a drug addiction. 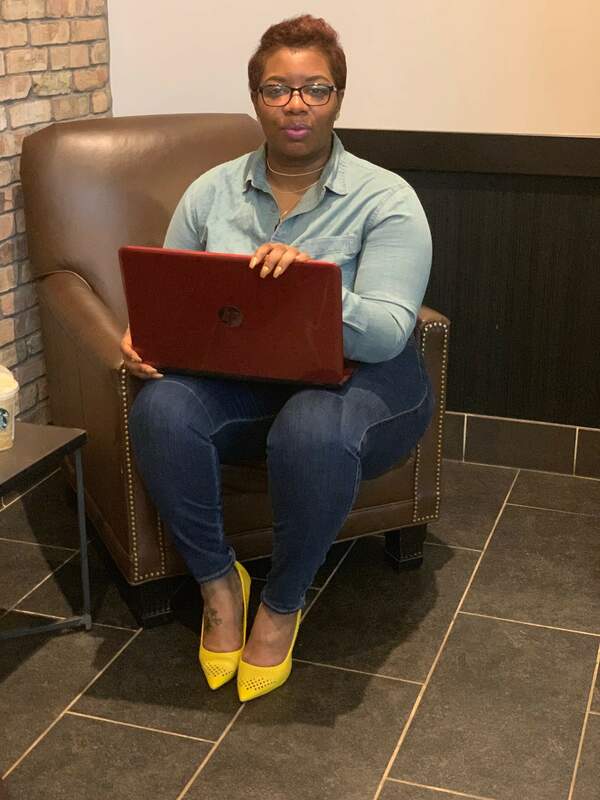 According to the Chester County High School graduate, arguably the biggest challenge she faced was attracting sustained support from people she sensed had endured similar hardships with which she once struggled. Given the immeasurable strides Ross has made since the startup of Lanese Empowerment, it’s safe to assume her best and brightest days are well ahead of her — days that will include, among other things, the forthcoming release of her starting lineup of books. “She is looking forward to releasing her new book series,” said a spokesperson for Ross’ organization. All things considered, Ross is giddy in that she can finally profess she’s walking fervently in her God-ordained purpose. Having resided in Nashville for the past decade-and-a-half, Ross holds a Bachelor of Science Degree in Organizational Leadership and Communication from Bethel University in McKenzie, Tennessee. Consequently, she earned a Master’s in Organizational Management from Nashville’s Belmont University. “I was told when I started this business that I needed to define a niche,” Ross said. “Well I did and that’s all people who have the desire and passion to live an extraordinary life despite the challenges of bad credit, debt, failed marriages, loss of a job, low self-esteem, terrible childhood, underprivileged environments, or lack of joy in their hearts, confusion about their path in life, bad grades, teenage pregnancy, drug addiction, and even those who need clarity on their career paths. That, to her credit, is worthy of making headlines. 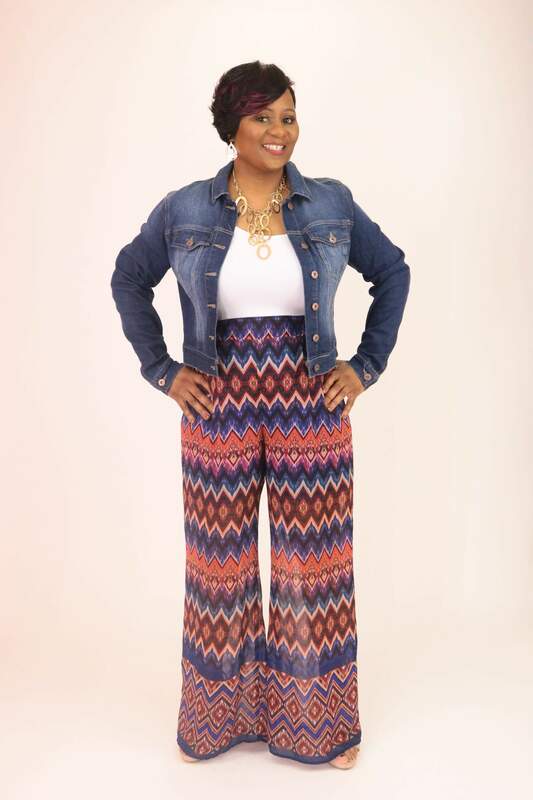 For more information about Nashville-area Businesswoman/Author Tamica Ross of Lanese Empowerment, or to schedule her for a public appearance, a book signing or speaking engagement, connect with her via Facebook at: https://www.facebook.com/tamica.ross.75. 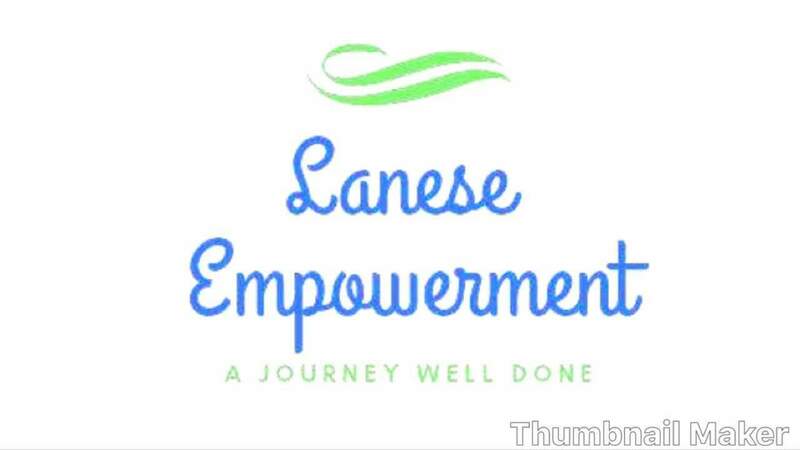 Also, send email to: laneseempowerment@gmail.com. Just before midday EST on Thursday, Alandria Lloyd paused momentarily to assess the overall landscape of her life, particularly within the past year or so. THING OF BEAUTY — A native Natalbany, Louisiana, Alandria Lloyd, 33, was named Making Headline News’ International Women’s Day Woman of the Year for 2018, edging out 10 other women across the country who were considered for this honor by the publication’s editorial staff. As usual, she found herself guilty of praising her way through. Fortunately for Lloyd, an Atlanta-area businesswoman and devout woman of faith, it is due in large to her bend-but-don’t-break-faith, coupled with her valiant contributions to her community, that have given way to what ultimately had turned out to be her grandest surprise in some time. 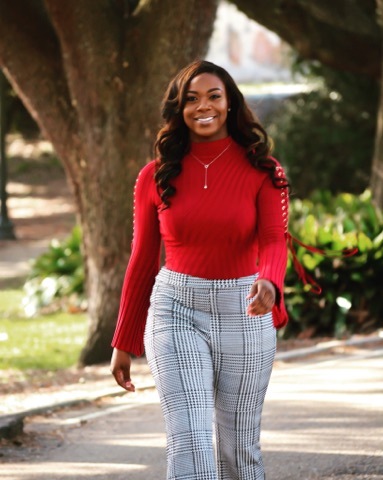 A native of Natalbany, Louisiana, Lloyd, 33, was named Making Headline News International Women’s Day Woman of the Year for 2018, edging out 10 other women across the country who were considered for this honor by the publication’s editorial staff. Originally called the International Working Women’s Day, this day is celebrated annually on March 8 and customarily commemorates the movement for women’s rights. According to www.internationalwomensday.com, organizations and individuals around the world have collectively become committed to helping women and girls achieve their ambitions, challenge conscious and unconscious bias, as well as call for gender-balanced leadership and value women and men’s contributions equally. Also, this day was designed in part to create inclusive flexible cultures. From awareness-raising to concrete action, organizations rallied their people to pledge support to help forge gender parity on International Women’s Day and beyond, according to a spokesperson for IWD. 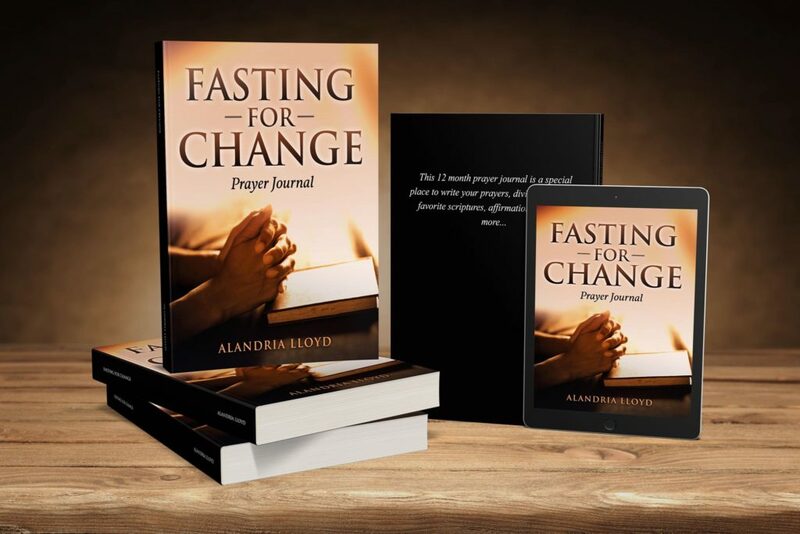 Having authored “Fasting For Change” Prayer Journal, Lloyd is also the proud founder of Change Agent Outreach Ministries, LLC, a relatively newly ministry she established in November 2017. Given the notable strides she’s made within the past year, many who know Lloyd agreed that this honor was well deserved for an empowering, beloved woman who has gone to great lengths to give back mightily to her community. 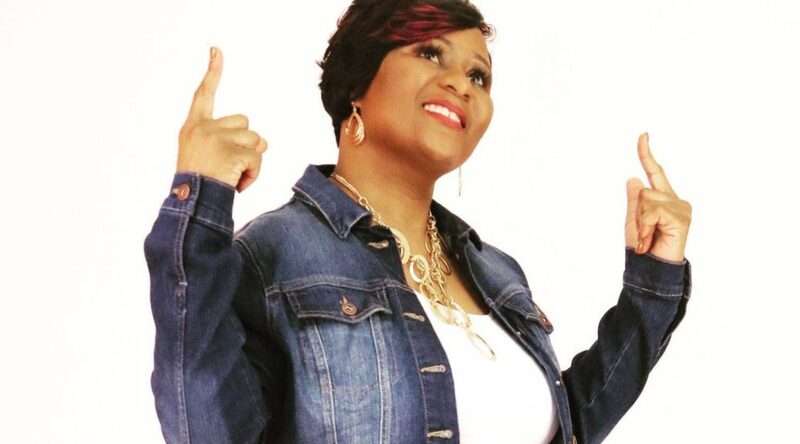 Lloyd is the proud founder of Change Agent Outreach Ministries, LLC, a relatively new ministry she established in November 2017. 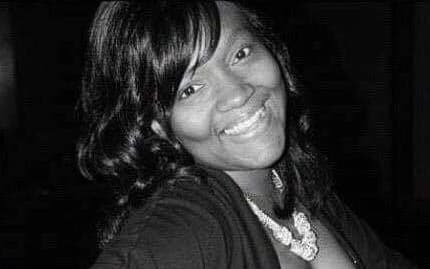 An organization that is powered by her A’Maya’s Army nonprofit organization, Change Agent Outreach Ministries’ primary focus is centered on serving single mothers, particularly those who have suffered the lost a child (or of children). 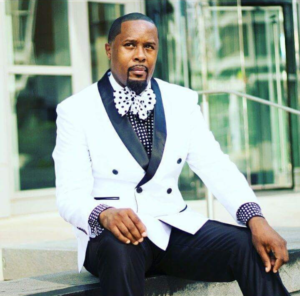 “My ministry is encouraging and mentoring mothers who have experienced a similar loss,” Lloyd said in a January interview with Making Headline News. In the coming months, Lloyd will be afforded the golden opportunity to further promote her organization. 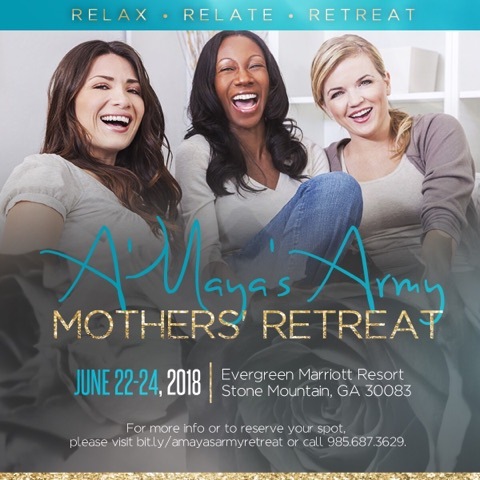 From June 22-24, Lloyd will host A’Maya’s Army Mothers Retreat, a three-day event designed to encourage and inspire mothers who have experienced the loss of a child. 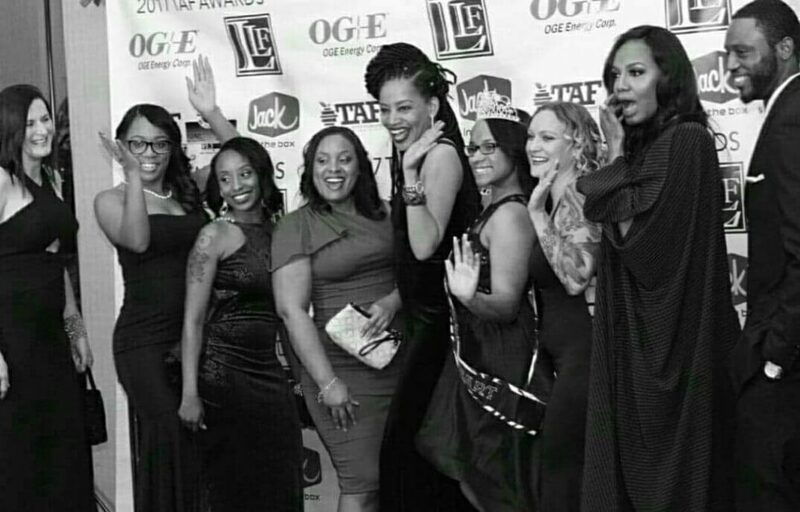 Accompanied by the theme, “Mask Off,” the weekend retreat will take place at the Evergreen Marriott Resort in nearby Stone Mountain, Georgia, during which attendees will have an opportunity to take off the mask and openly express how they feel without the fear of judgment. YOU GO GIRL — Given the notable strides she’s made within the past year, many who know Lloyd agreed that this honor was well deserved for a businesswoman who has gone to great lengths to give back mightily to her community. All things considered, if anyone can greatly attest to being left to press and navigate their way through arguably the toughest of losses, surely, Lloyd can — especially after having to make sense of having suffered the losses of premature babies at the ages of 15 and 16. “After losing two children so close together, I was on the verge of losing my mind,” Lloyd said during an interview with MHL in January. Nearly two decades removed from having witnessed undoubtedly the darkest chapters of her young life, Lloyd on Thursday was blindsided by a rather unlikely honor. Talk about fielding some much-needed good news on an otherwise challenging and gloomy morning. What a difference this past year has made. TEN-NES-SEE AND TASTE THIS CHICKEN SALAD, Y’ALL — An up-and-coming business that is located at 3709 South Hickory Ridge Mall in Suite 460 of the historic Hickory Hill Ridge Mall, Darwin and Kyra Henderson’s Alex Farms Hickory Smoked Chicken Salad has become a popular establishment for Memphians, giving the buzz it has created since its inception a little more than a year ago. 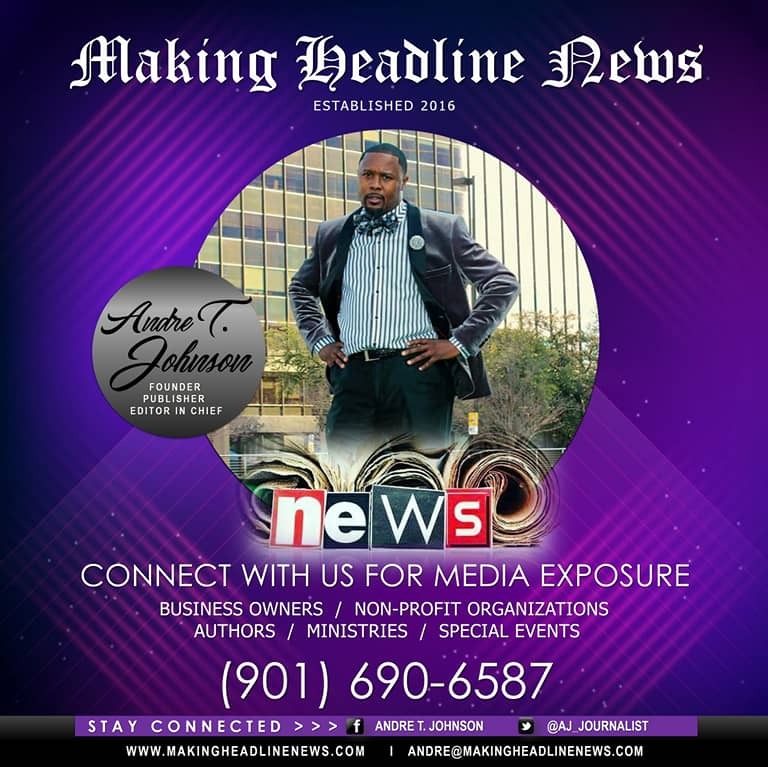 Fortunately for Memphis-based entrepreneur Kyra “Sha” Henderson, she thought it essential some time ago to thoroughly embrace the life-changing advice of her husband, Darwin Henderson. OMG! LOOK AT THIS! 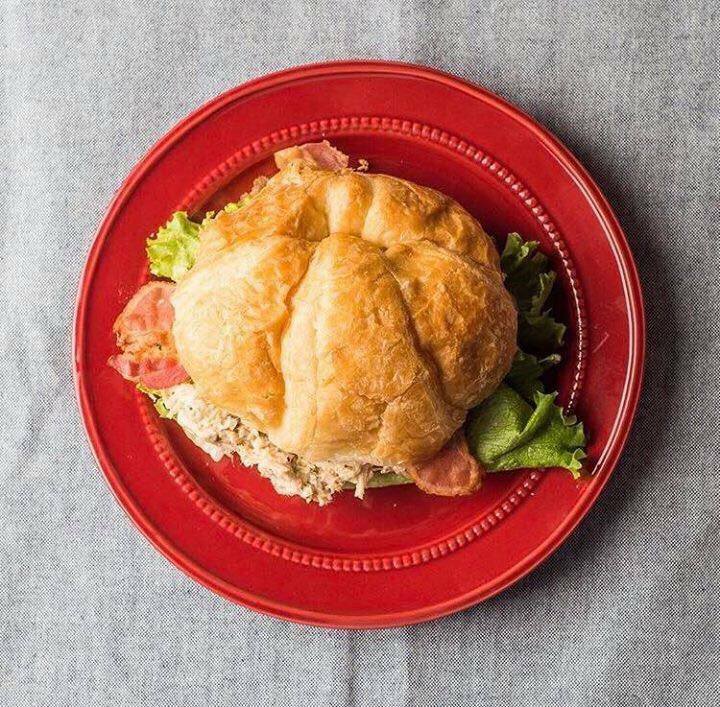 Widely considered a “game changer” according to Kyra Henderson, her husband’s delectable, mouth-watering chicken salad has become one of the most sought-after products throughout the Memphis-metropolitan area, let alone a favorite amongst those who weren’t particularly fans of such a food. That’s because her beloved companion, to his distinct credit, is responsible for encouraging his wife to broaden her entrepreneurial horizon by sharing his famous chicken salad with those outside of their family. 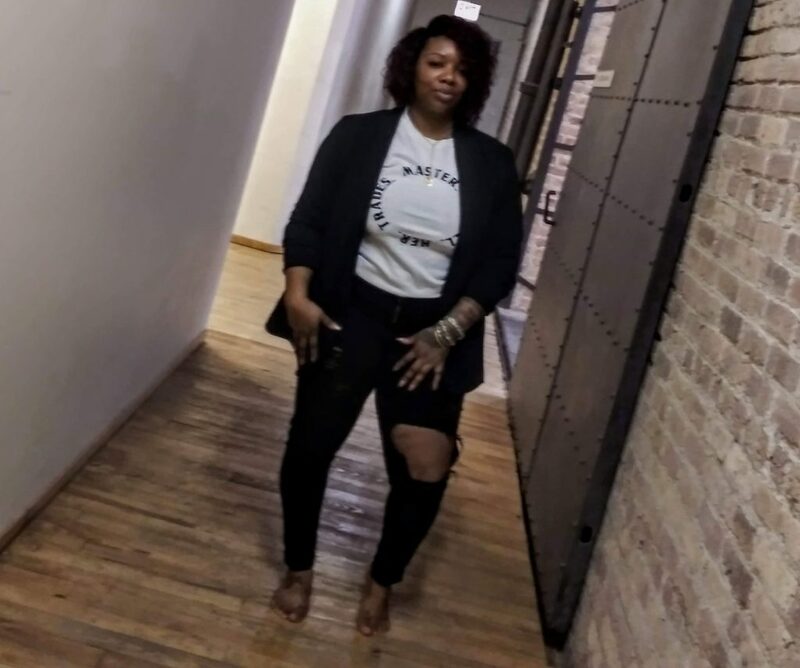 That Kyra Henderson had graciously heeded the advice of her husband and other family members has benefited her mightily. So much, in fact, that the Hendersons essentially are building an impressive empire right before our very eyes as owners of Alex Farms Hickory Smoked Chicken Salad. An up-and-coming business that is located at 3709 South Hickory Ridge Mall in Suite 460 inside the historic Hickory Ridge Mall, Alex Farms Hickory Smoked Chicken Salad has become a popular establishment for Memphians, given the buzz it has acquired since its inception a little more than a year ago. 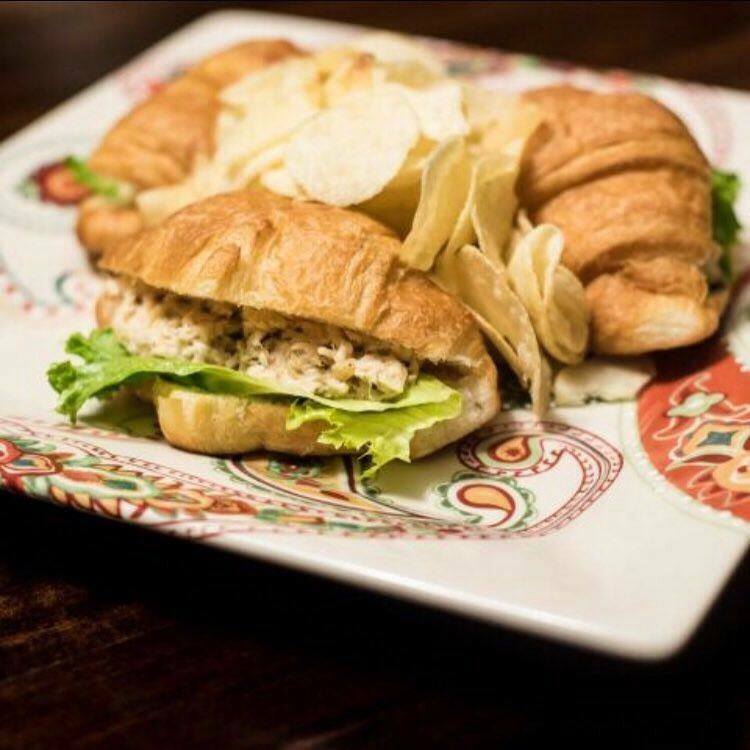 Widely considered a “game changer” according to Kyra Henderson, her husband’s delectable, mouth-watering chicken salad has become one of the most sought-after products throughout the Memphis-metropolitan area, let alone a favorite amongst those who weren’t particularly fans of such a food. 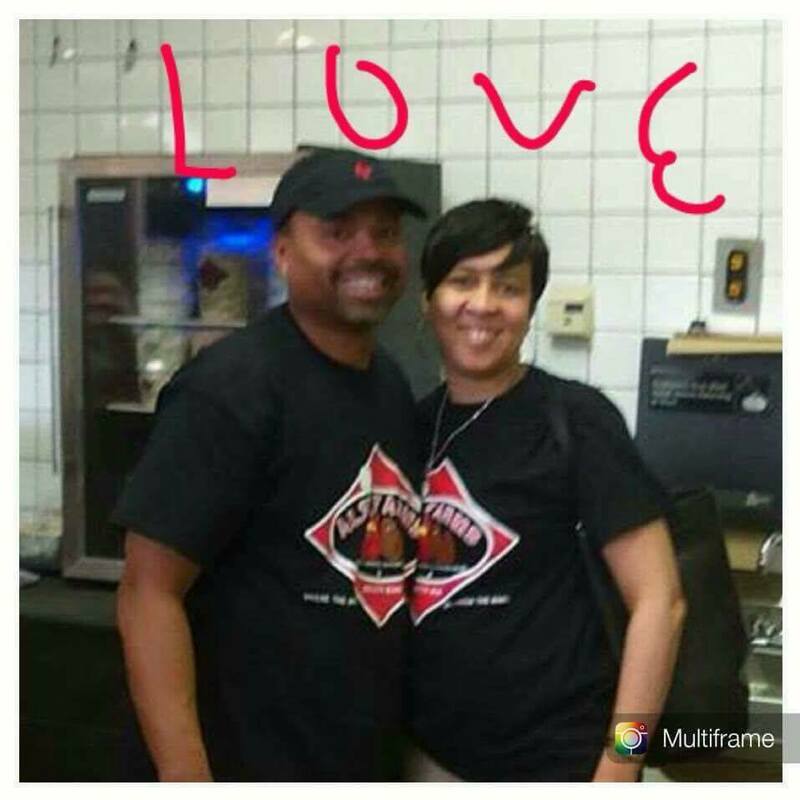 “Our product is made fresh daily,” Kyra Henderson, a 1991 Memphis Hamilton High graduate, said. 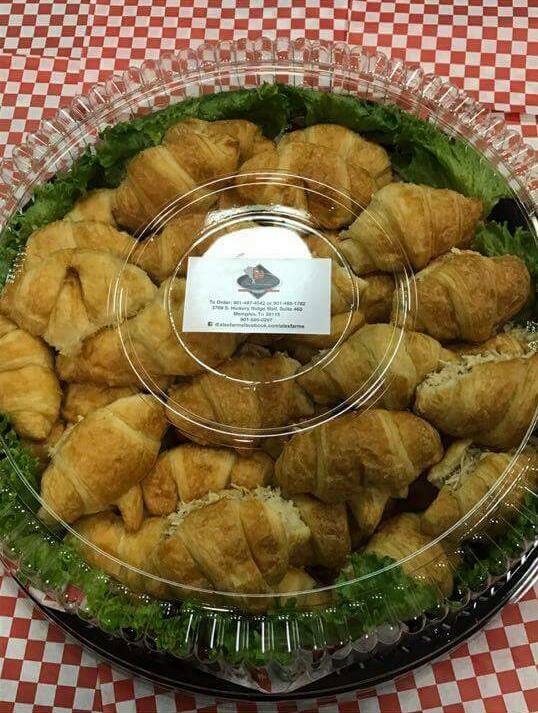 Not only that, what has set the Hendersons’ product aside from others similar to it is that their chicken salad is filled with a unique smoked flavor that keeps customers coming back for more. So what is Darwin’s secret? Good luck trying to convince him to relinquish or share a famous recipe that figures to remain undisclosed indefinitely. 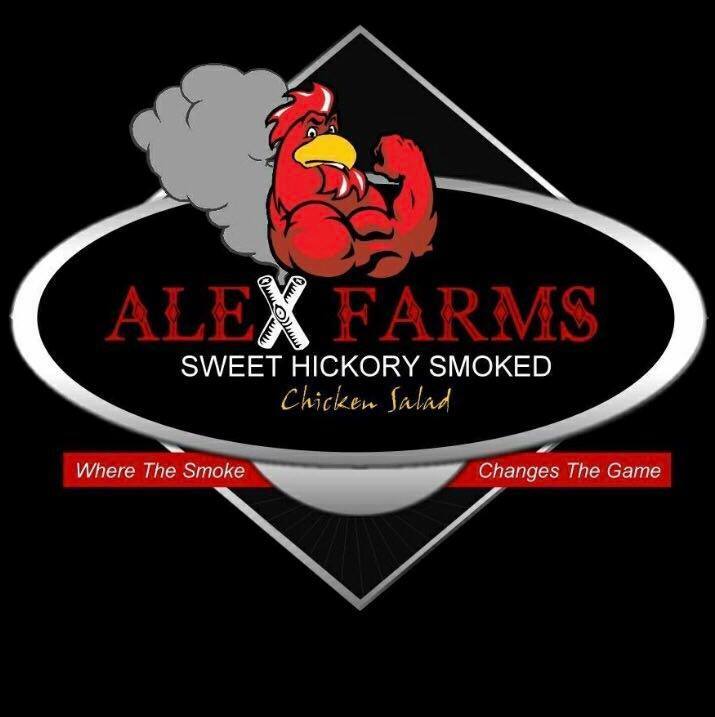 FOLLOW ALEX FARMS HICKORY SMOKED CHICKEN SALAD VIA SOCIAL MEDIA: https://www.facebook.com/alexfarmschickensalad/. 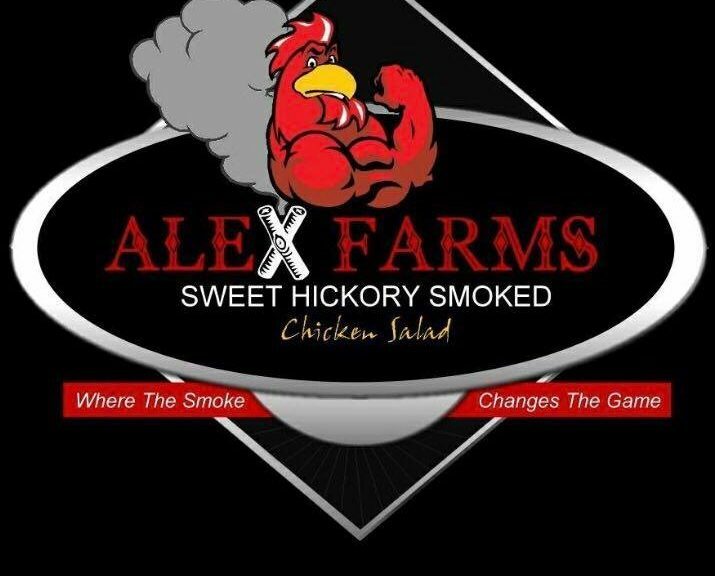 WE AIN’T TELLING Y’ALL NOTHING — What sets Alex Farms Hickory Smoked Chicken Salad aside from others similar to it is that its chicken salad is filled with a unique smoked flavor that keeps customers coming back for more. So what is their secret? Good luck trying to convince the Hendersons to relinquish or share a famous recipe that figures to remain undisclosed indefinitely. So scrumptious and desirable the Hendersons’ chicken salad is that those who customarily find their way inside the Hickory Ridge Mall can’t seem to think of enough favorable names for it. 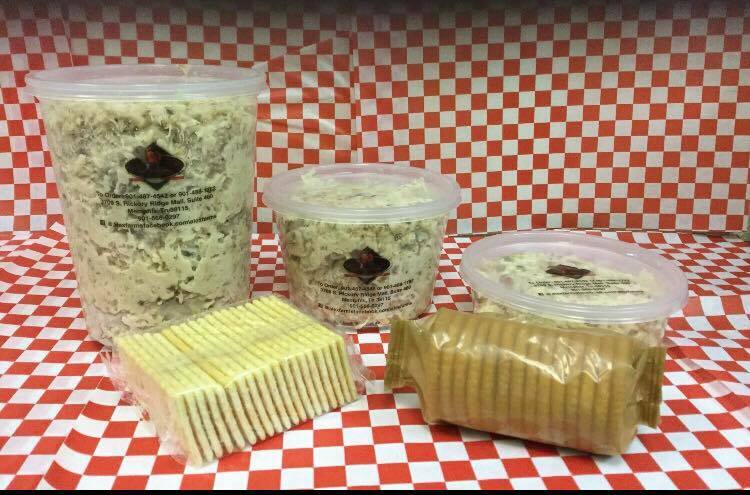 As if Memphians haven’t become addicted to Alex Farms Hickory Smoked Chicken Salad, it seems the Hendersons’ product is starting draw rave reviews amongst residents outside of the Bluff City. According to Kyra Henderson, one customer actually caught a flight bound for Memphis just to make a special visit to her place of business and purchase the famous chicken salad. Talk about having a monumental impact in a once downtrodden, storm-damaged Southeast Memphis-area mall that appears well on its way to returning back to respectability. TALK OF THE TOWN — Interesting enough, the array of stories, testimonies, and positive feedback surrounding Alex Farms Hickory Smoked Chicken Salad are one what the Hendersons will cherish for a lifetime. Interesting enough, the array of stories, testimonies, and positive feedback surrounding Alex Farms Hickory Smoked Chicken Salad are what the Hendersons will cherish for a lifetime. Heck, you’ve just gotta love Darwin, the mastermind behind what is shaping up to be a family-oriented empire — with God, their Helper, leading the way. In that case, heck, you’ve just gotta love Alex too. 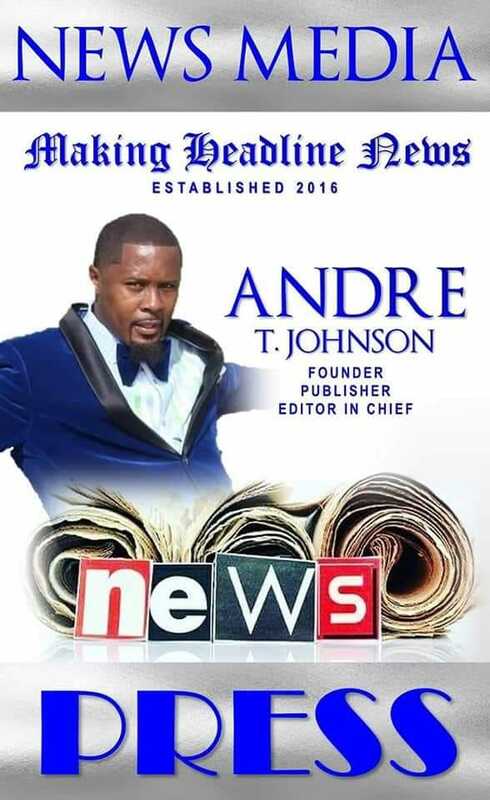 Andre Johnson is Founder and Publisher for Making Headline News. A 2000 graduate of the University of Memphis School of Journalism and a former staff reporter the Memphis Commercial Appeal newspaper, Johnson covers the NBA Southwest Division from Dallas, Texas. 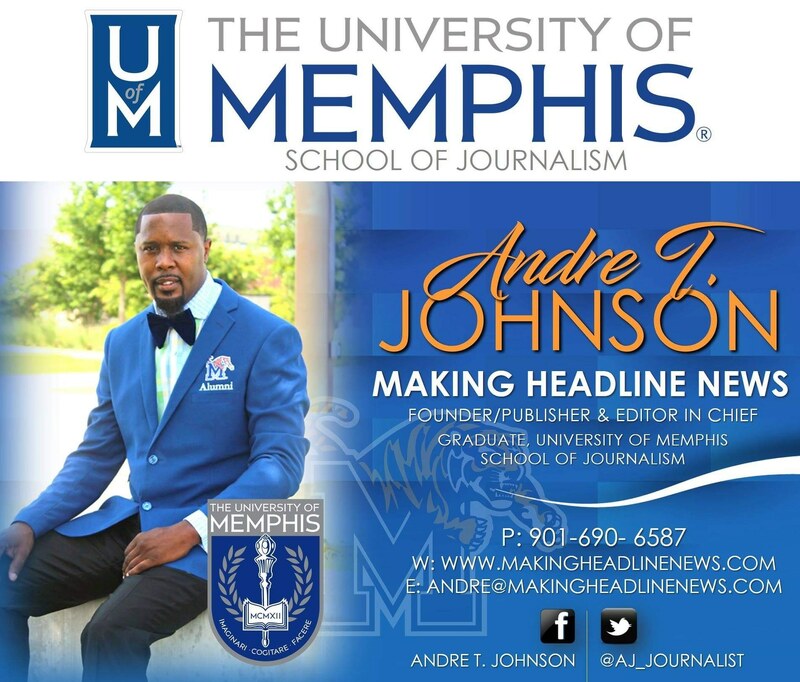 To reach Johnson, send an email to memphisgraduate@yahoo.com. Also, follow him on Twitter @AJ_Journalist. ISN’T SHE LOVELY? 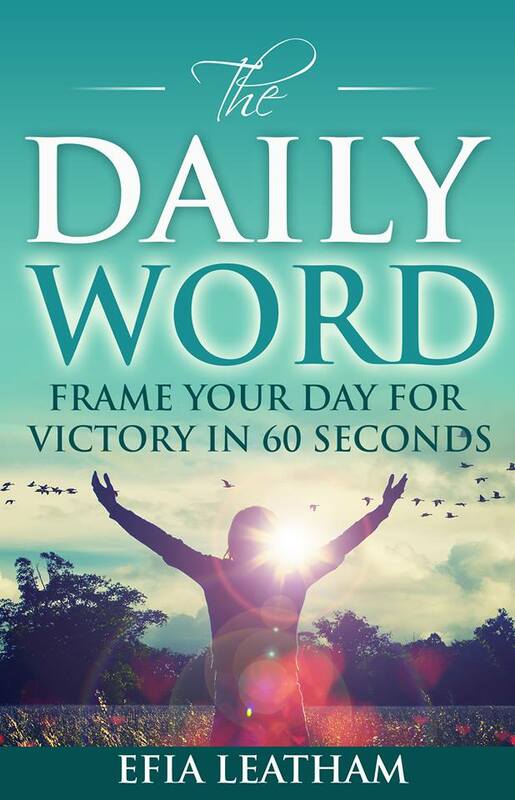 Toronto, Ontario-based author Efia Leatham’s The Daily Word: Frame Your Day for Victory In 60 Seconds, by all accounts, is a written document that will greatly help readers focus — and refocus — their thoughts to position their day and ultimately reap positive and successful results. 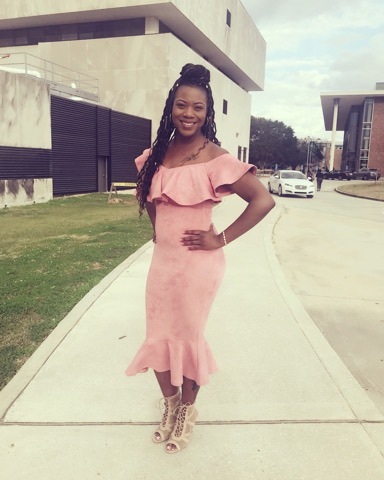 Just after sunrise Saturday morning, as always, Efia Leatham took to her Facebook page and offered some life-enhancing, thought-provoking, spiritually gut-checking words of encouragement. BETTA GET IT — A 376-page book that was officially released on May 26, 2016, The Daily Word, according to a description at Amazon.com, is widely viewed as a tool and resource, of sorts, to encourage, inspire, and share real love as Leatham’s reading audience seek answers to address thoughts pertaining to being loved, all while recognizing and connecting with their purpose. Ironically and to her distinct and immeasurable credit, that she routinely shifts her ears to God’s Voice and deems it essential daily to seek Him for direction and purpose are amongst the reasons Leatham is savoring yet another monumental milestone, all while simultaneously living the abundant life Christ came to give us. BEACON OF LIGHT — The Daily Word, by all accounts, is a written document that will greatly help readers focus — and refocus — their thoughts to position their day and ultimately reap positive and successful results. “The vision was given last year January, but it had been in the works brewing for four years,” Leatham told Making Headline News this week. 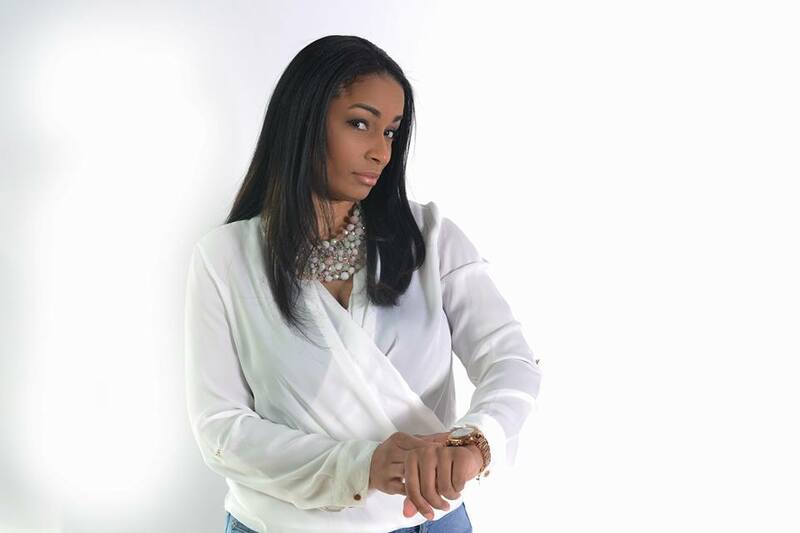 The vision to which Leatham, a Toronto, Ontario native, is alluding is her much-anticipated, awe-inspiring book entitled, The Daily Word: Frame Your Day for Victory In 60 Seconds. ALL IN GOD’S TIMING — In further detailing the purpose and mission for her book, Leatham emphasized that her desire to finally assemble it was simple: because God said it was time. A 376-page book that was officially released on May 26, 2016, The Daily Word, according to an eloquent description at Amazon.com, is widely viewed as a tool and resource, of sorts, to encourage, inspire, and share real love as Leatham’s reading audience strategically seek answers to address thoughts pertaining to being loved, all while recognizing and connecting with their purpose. 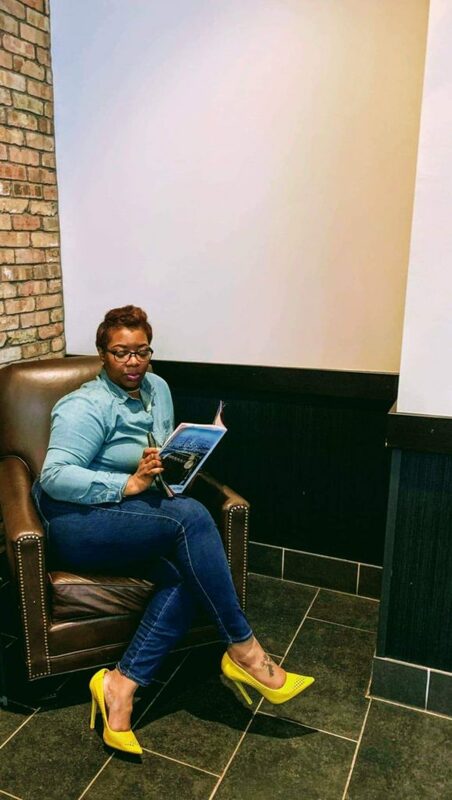 BUY EFIA’S BOOK NOW: https://www.amazon.com/Daily-Word-Frame-Victory-Seconds/dp/0995186804. WALKING IN VICTORY — By and large, people who routinely seek, pray to and cry out to God must first know what it means to walk in victory and, most importantly, do it with the right motives, something by which Leatham’s book teaches. In a nutshell, the time has come that we grasp that vital notion that victory begins in the mind. 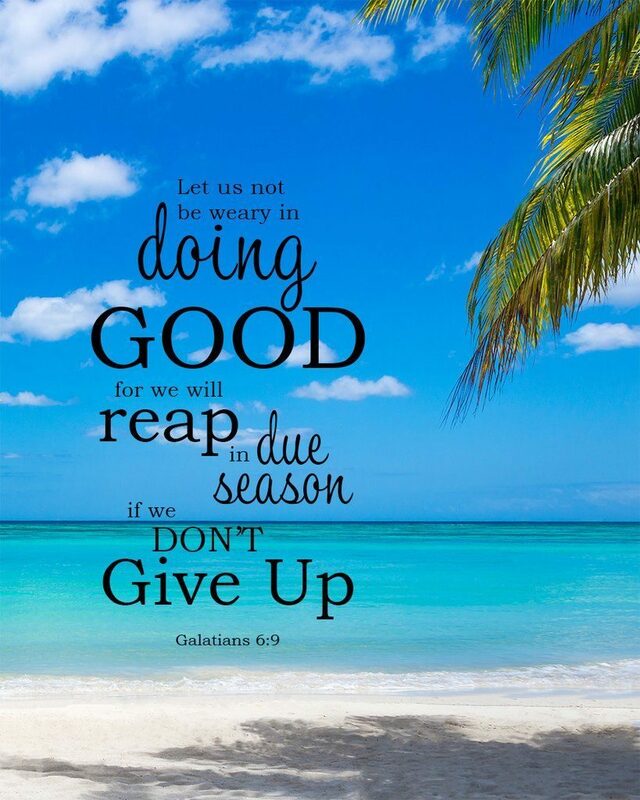 In essence, The Daily Word is a spiritually-empowered beacon of light in a variety of aspects in that it greatly helps readers observe life through God’s lenses of love so that they, in turn, can command — and possess — their daily victories. There’s more to this tear-jerking, captivating book that figures to not only lift up Christ but, most of all, inspire people to draw closer to Him. The Daily Word, by all accounts, is a written document that will greatly help readers focus — and refocus — their thoughts to position their day and ultimately reap positive and successful results. 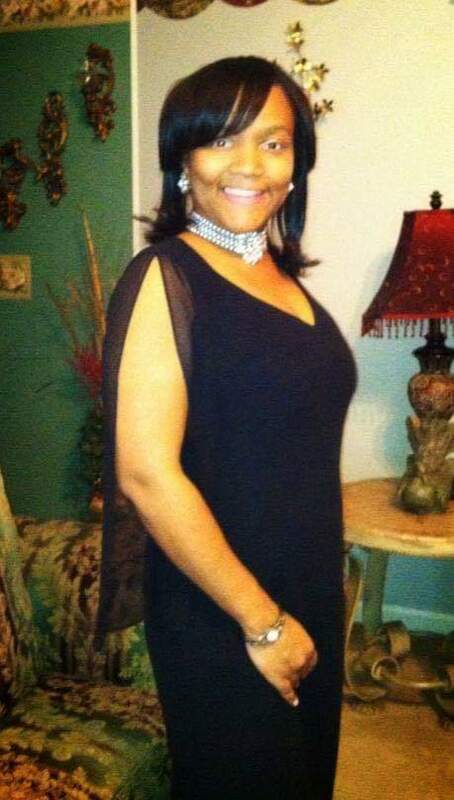 ARMED WITH WEALTH OF GODLY BEAUTY — Ironically and to her distinct and immeasurable credit, that she routinely shifts her ears to God’s frequency and deems it essential daily to seek Him for direction and purpose are amongst the reasons Leatham is savoring yet another monumental milestone while simultaneously living the abundant life Christ came to give us. In further detailing the purpose and mission for her book, Leatham emphasized that her desire to finally assemble it was simple: because God said it was time that her voice be heard not just north of the border, but around the world — so that men would see her good works and glorify Him, if you will. Now, in less than one year since its much-anticipated inception, Leatham — all because she steadfastly obeyed the voice of God — is enlightening and reminding the universe on the importance of winning everyday regardless of their present situation and circumstances. By and large, people who routinely seek, pray to and cry out to God must first know what it means to walk in victory and, most importantly, do it with the right motives, something by which Leatham’s book teaches. In a nutshell, the time has come that we grasp the life-changing, wholesome, vital notion that victory begins in the mind. REMEMBERING CLIFF — Leatham’s esire to compose her book was fueled after attending her Uncle Cliff’s funeral in September of 2012. Just as she had earnestly desired in a Facebook post shortly after sunrise Saturday. “It started as text messages and Facebook posts for friends and family and from there was sent around the world by the recipients of the message,” said Leatham, explaining other factors that led to her producing her book. “And not a day has ever been missed since then. After spending time in prayer and fellowship each morning with the Lord, He gives me a word to share with His people. And all the time, God is ever so good. 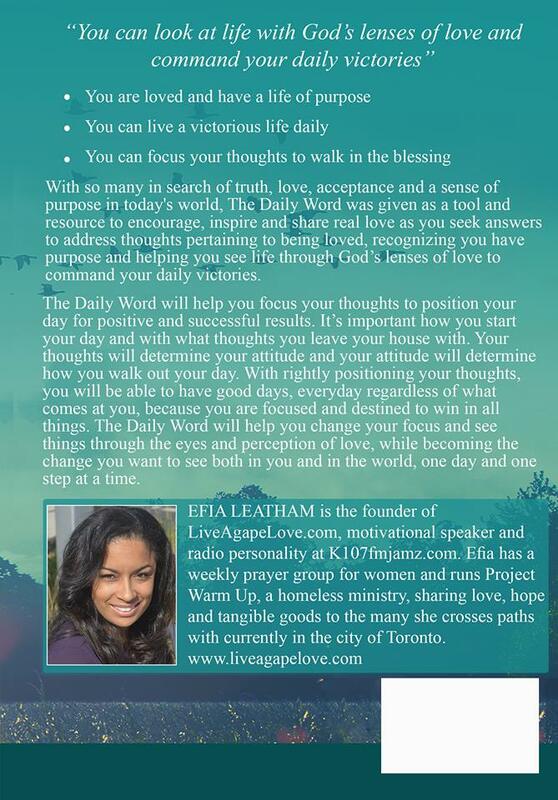 For more information about Efia Leatham’s, The Daily Word: Frame Your Day for Victory In 60 Seconds, follow Efia on Facebook under Efia Leatham. Also, send email to: ejleatham@gmail.com. DUNCANVILLE, Texas — Without question, Kenneth Talton loves his son. Surely, he wants the best for him. So much, in fact, that every now and then, Talton deems it necessary to demonstrate some tough love as a way to steer him in the right direction. Take, for instance, how some time ago when Talton’s son, Erik Talton, assembled a Facebook page. You know, as expected, he was only doing that about which his peers were engaging in. 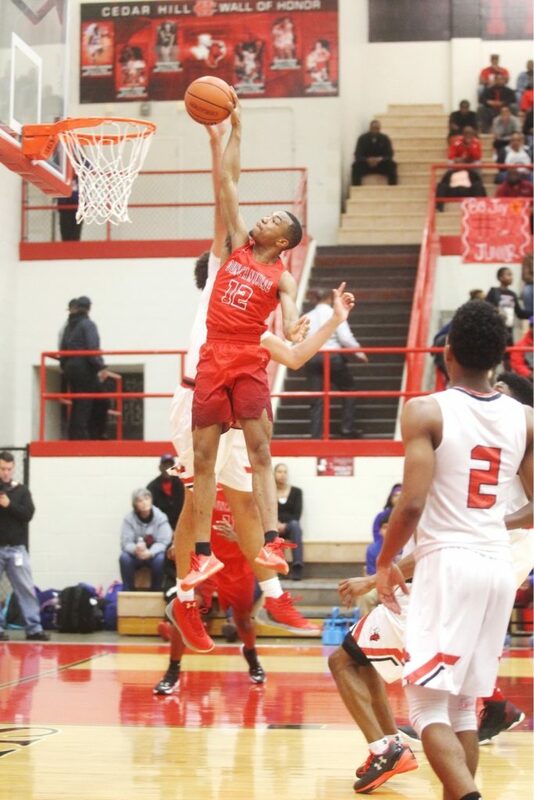 MAKING MAJOR MOVES — An honor student who’s ambition in the coming months is to suit up in college basketball uniform, Erik Talton is an electrifying, high-leaping shooting guard for perennial power Duncanville (Texas) High, which checked in at No. 25 in the state in the latest Maxpreps.com poll that was released last week. Still, his father had other reasonable ideas. By all accounts, he sensed that Facebook could potentially be a recipe for disaster for a kid with dazzling basketball skills. Consequently, Kenneth Talton’s firm gesture and forthright response to his son having erected a Facebook, as it turned out, has proven beneficial in a variety of ways, most notably on the basketball court. 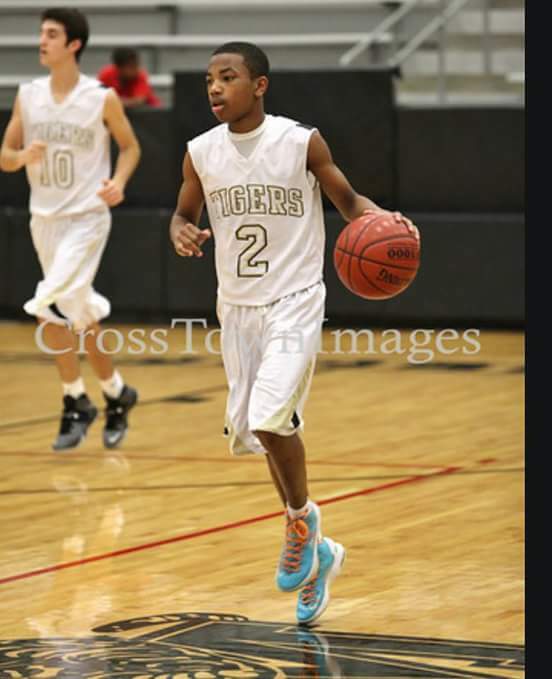 CHECK OUT ERIK TALTON: http://www.ncsasports.org/mens-basketball-recruiting/texas/duncanville/duncanville-high-school1/erik-talton. Although his father unceremoniously suspended his Facebook account, Erik Talton, to his created, essentially has been nothing short of impressive. In fact, while playing alongside fellow Duncanville seniors Dexter Johnson, Jr. and Tyler Watkins — the three have been teammates on the same AAU team since fifth grade — Erik Talton, for a lack of better words, have posted favorable statuses not on social media, but on the court as evidenced by the slew of recruiting analysts that have followed him in recent years. 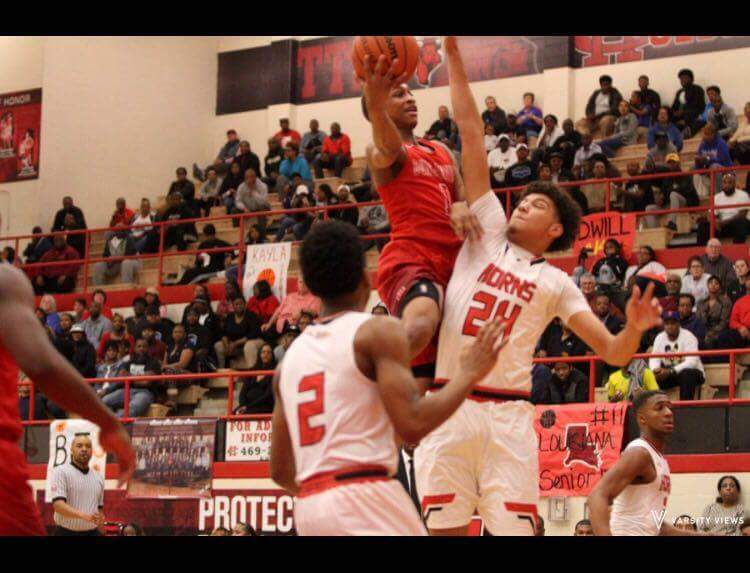 An honor student who’s ambition in the coming months is to suit up in a college basketball uniform, Erik Talton is an electrifying, high-leaping shooting guard for perennial power Duncanville (Texas) High, which checked in at No. 25 in the state in the latest Maxpreps.com poll that was released last week. Although his father demanded that he unceremoniously suspend his Facebook account, Erik Talton, to his credit, essentially has been nothing short of impressive. 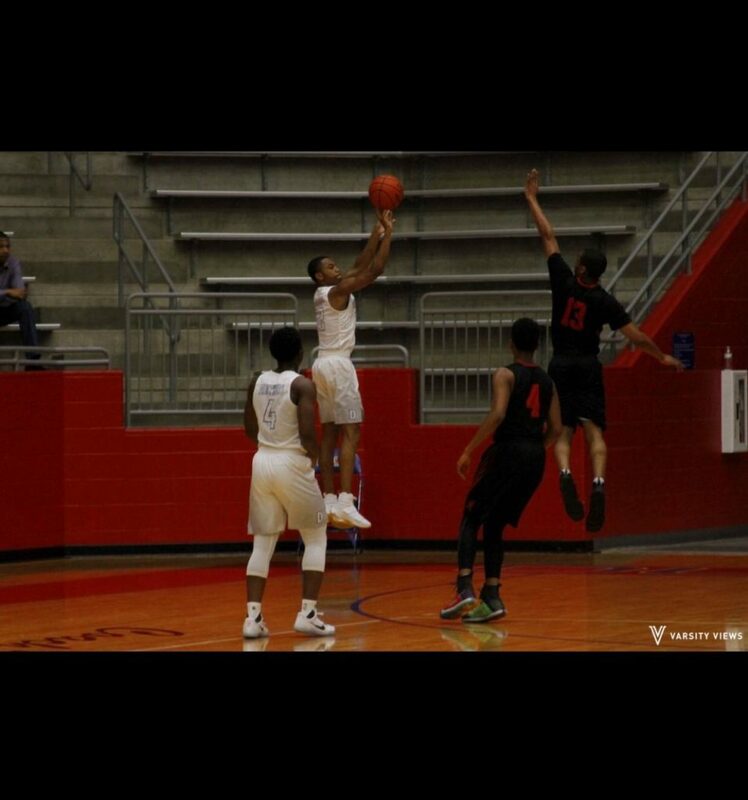 In fact, while playing alongside fellow Duncanville seniors Dexter Johnson, Jr. and Tyler Watkins — the three have been teammates on the same AAU team since fifth grade — Erik Talton, for a lack of better words, have posted favorable statuses not on social media, but on the court, as evidenced by the slew of recruiting analysts who have followed him in recent years. 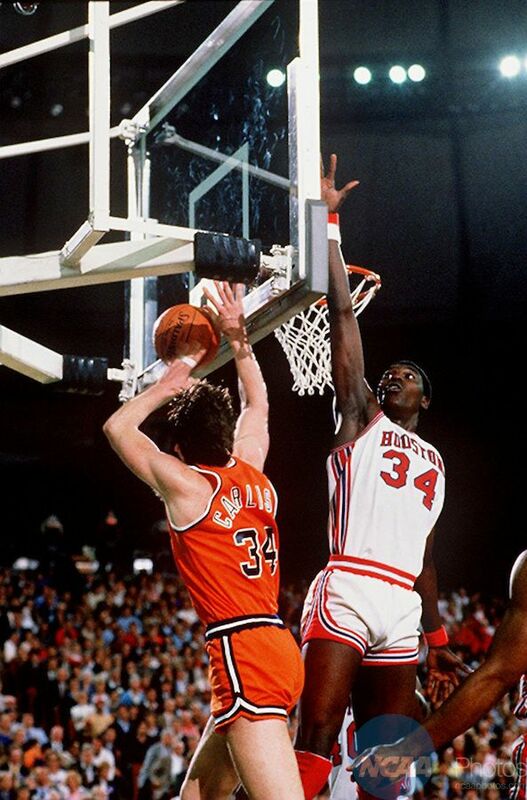 For starters, the 6-foot-2, 155-pound senior was spotted dunking for the first time when he was a sophomore. It wasn’t long thereafter that he began to add to his basketball repertoire, having established himself as a player whose strengths consists of shooting efficiently from mid-to-long range, creating his own shot off the dribble and, most importantly, demonstrating the ability to get his teammates in the flow of the game. For his valiant efforts, his solid body of work has drawn the attention of several schools, including Frank Phillips College, Hartnell Junior College in California, Northeastern Junior College in Colorado), The King’s College in New York, Norwich University, Luther College, and Kansas Wesleyan University, he said on Monday. COLLEGE BOUND FOR SURE — For his valiant efforts, his solid body of work has drawn the attention of several schools, including Frank Phillips College, Hartnell Junior College in California, Northeastern Junior College in Colorado), The King’s College in New York, Norwich University, Luther College, and Kansas Wesleyan University, he said on Monday. Still, he realizes now is not the time to go on cruise control, in large part because he has yet to field any official offers. How else to explain his remarkable display this past summer when following what was a banner junior campaign, he enjoyed what he described as a “very big summer” on the AAU circuit when he averaged 20 points per game and led his team to consecutive championships in two major tournaments (The Great American Shootout in Duncanville and the Fab48 in Las Vegas)? In essence, Erik’s Talton’s progress on and off the court emerged amid the wake of adversity, according to his father. “The adversities Erik had to overcome from losing his cousin which was his best friend at the age of six and, at the age of eight, having multiple surgeries on his forearm and maintaining his drive and his desire to once again play sports at the same level prior to his injury, to the custody issues between his mom and me, which ultimately led to him moving completely with me,” Kenneth Talton said. 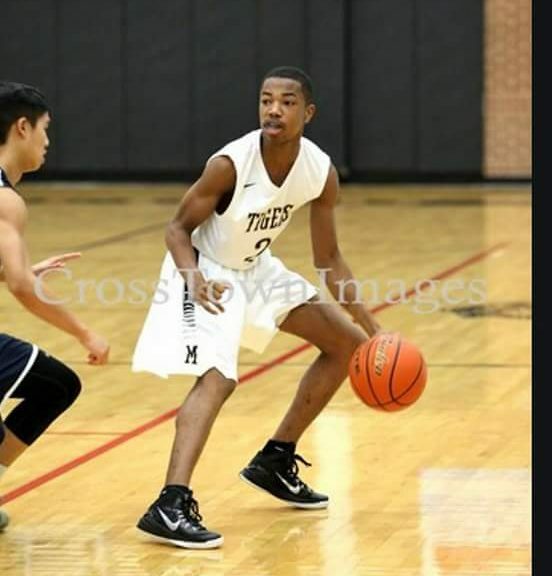 All things considered, such an untimely move from nearby Mansfield to Duncanville has in no way, shape or form hamper Erik Talton, who admittedly feels confident about his chances of playing at the collegiate level. And to think, he didn’t need a Facebook page to express to the masses who he is. The basketball court was a big enough platform. “Whatever college offers me scholarship, they will get a player with tenacity, who’s a competitor, an athlete, a hard worker, a defender, a shooter and a winner,” Erik Talton said. What a favorable difference that tough love has made. 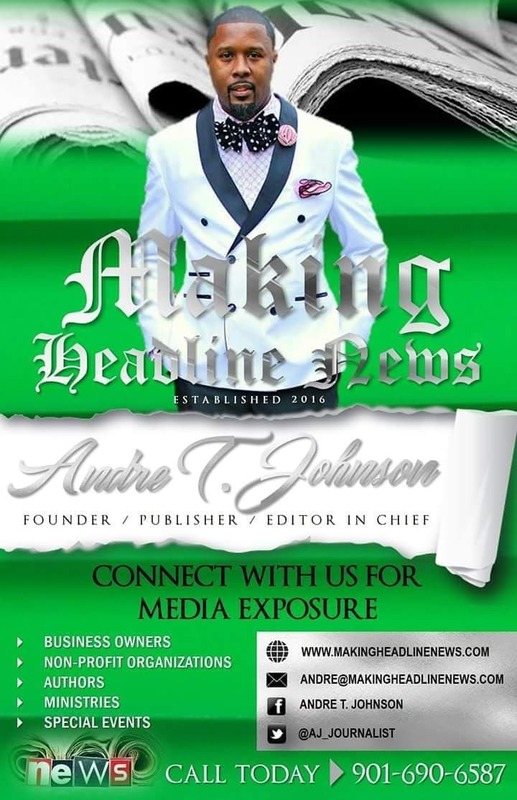 Andre Johnson is the founder and publisher of Making Headline News. A 2000 graduate of the University of Memphis School of Journalism and a former sportswriter for the Memphis Commercial Appeal newspaper, Johnson covers the NBA Southwest Division from Dallas, Texas. 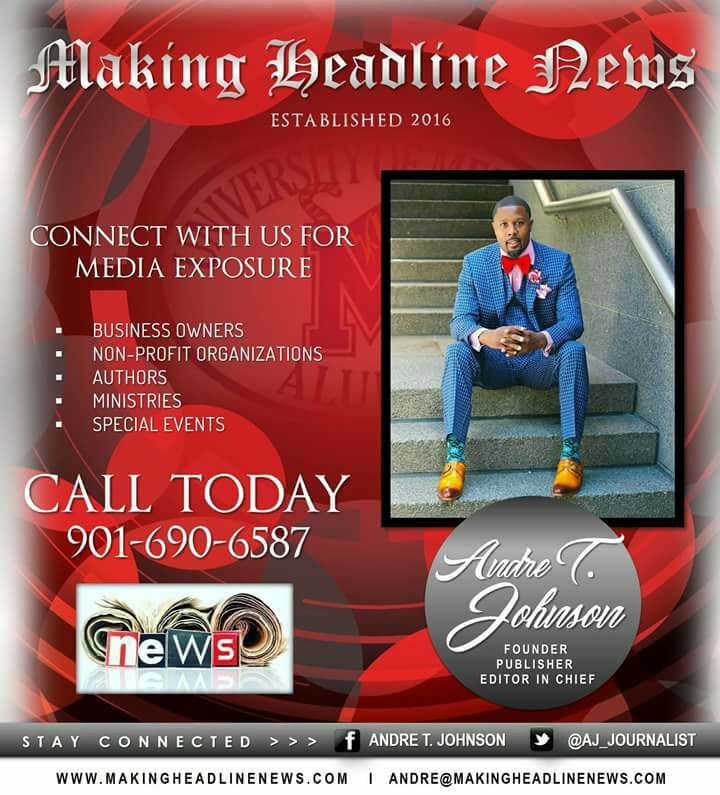 To reach Johnson, send an email to memphisgraduate@yahoo.com. Also, follow him on Twitter @AJ_Journalist. 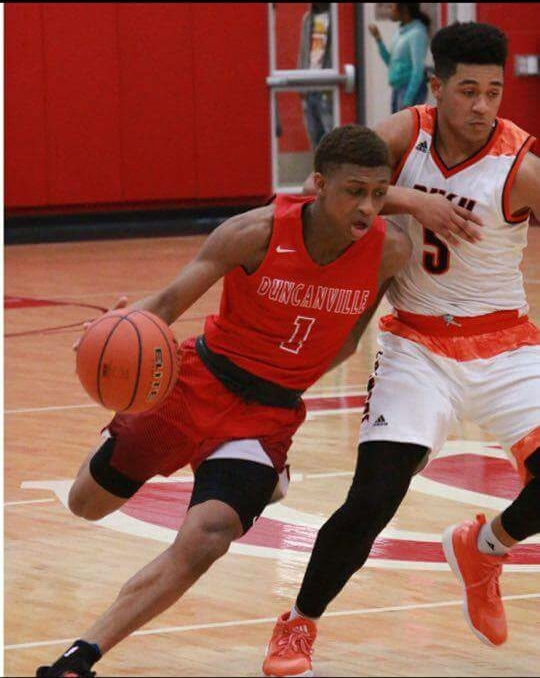 TANTALIZING TYLER — A slim, speedy 6-foot-1, 156-pounder, Duncanville High senior point guard Watkins has yet to receive any official offers. However, chances of that changing in the foreseeable future certainly appears likely, considering he’s at least in the discussion amongst the schools that have him under their radar. 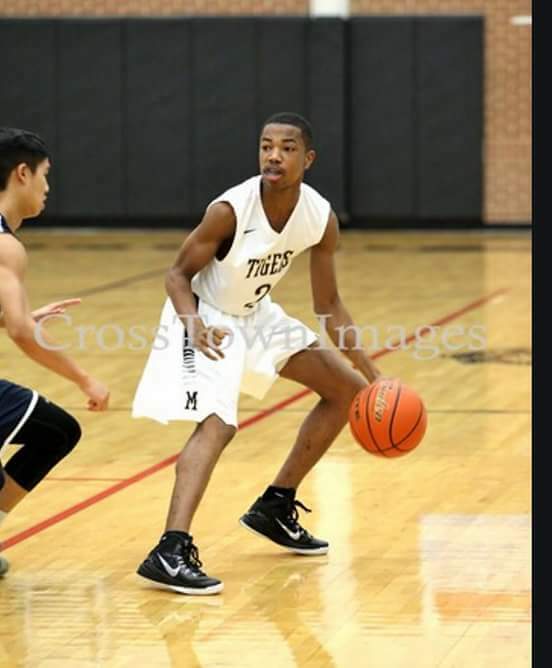 According to Watkins, Midwestern State, Southern Nazarene, University Of Massachusetts at Lowell, Oklahoma Wesleyan, and Paris Junior College are among the schools that have expressed interest in Watkins, the catalyst of a Duncanville team that is ranked No. 25 in Texas according to Maxpreps.com’s latest poll. DUNCANVILLE, Texas — Tyler Watkins doesn’t just think he can. Heck, he’s literally gone from thinking to knowing. 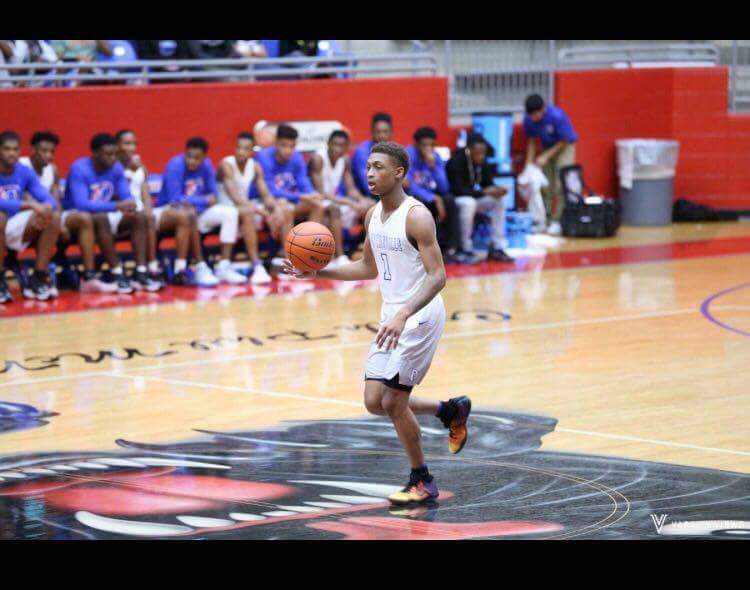 Take, for instance, how late Sunday night, Watkins, a senior point guard for Duncanville (Texas) High, dauntlessly issued a rather bold, spirited declaration when asked what he would like for college scouts and recruiters to know about him, particularly his quest toward garnering an athletic scholarship. “I can do all things through Christ who strengthens me,” Watkins, reciting the familiar Biblical passage of Philippians 4:13, told Making Headline News. And just like that, the kid whom, for a majority of his young life, has established a keen reputation that suggest, among other things, that he’s capable of defying the toughest of odds, appears destined to stage the unthinkable. 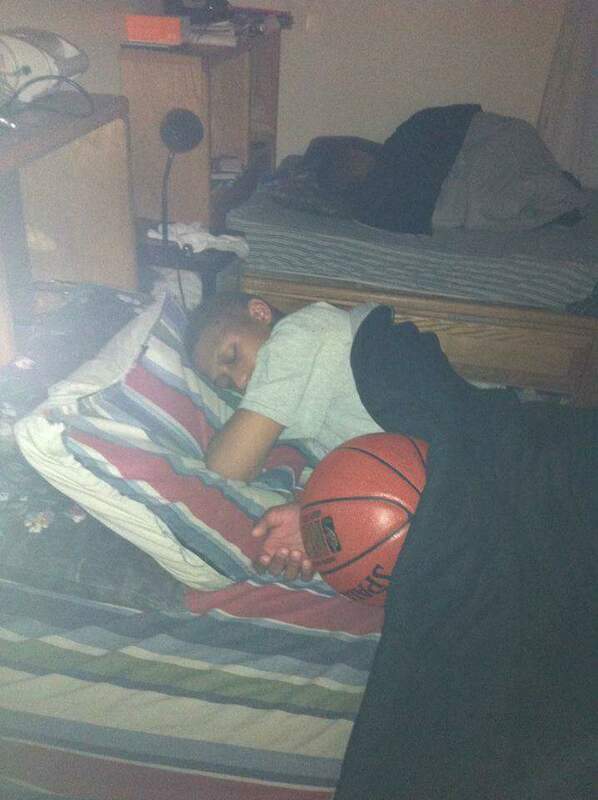 A slim, speedy 6-foot-1, 156-pounder who grew up sleeping with his basketball tucked under his arm, Watkins has yet to receive any official scholarship offers. However, chances of that changing in the foreseeable future certainly appears likely, considering he’s at least in the discussion amongst the schools that have him under their radar. According to Watkins, Midwestern State, Southern Nazarene, University Of Massachusetts at Lowell, Oklahoma Wesleyan, and Paris Junior College are among the schools that have expressed interest in Watkins, the catalyst of a Duncanville team that is ranked No. 25 in Texas according to Maxpreps.com’s latest poll. Aside from his mental assertiveness and favorable IQ as the Panthers’ floor general, Watkins acknowledged that amongst his notable strengths is his ability to penetrate and attack the rim, not to mention demonstrating the ability to become the floor facilitator. TEXAS TOUGH — Aside from his mental assertiveness and favorable IG as the Panthers’ floor general, Watkins acknowledged that his amongst his notable strengths is his ability to penetrate and attack the rim and demonstrating the ability to become the floor facilitators. Conversely, arguably his most notably weakness, in his estimation, is his inconsistency to shoot from long range, although he possesses an attractive midrange shot and has proven to be an aggressive defender. “I work on (my mechanics) every single day and I lift weights about three times a week,” Watkins said. Among those who are especially working diligently to help steer Watkins in the right direction, particularly with regards to upgrading his stock in landing a scholarship, are his parents, Leonard and Wendy Watkins. Both of whom are Corporate America professionals, Tyler Watkins’ parents have demonstrated unyielding support for a kid who first picked up a basketball at the age of four. That he hasn’t shown any signs of slowing down any time soon, Tyler’s parents, like his teammates and Duncanville’s coaching staff, are hopeful he’s afforded the golden opportunity they sense he deserves — putting his immense skills on display at the collegiate level. “The moment I realized that Tyler may actually have a future in basketball was after several coaches came to me after a tournament handing me their cards saying, ‘If your son ever needs a team to play for, please call me,’” Leonard Tyler said. The biggest mystery that remains, particularly at such a crucial stage in their son’s prep basketball career, is at what point will college coaches approach them with that same enthusiasm. The good news, at least for Tyler Watkins, is that the interest he’s generated in recent months is valid proof that he’s at least being considered for a full ride scholarship. PUTTN’ IN WORK — Aside from his mental assertiveness and favorable IG as the Panthers’ floor general, Watkins acknowledged that his amongst his notable strengths is his ability to penetrate and attack the rim and demonstrating the ability to become the floor facilitators. 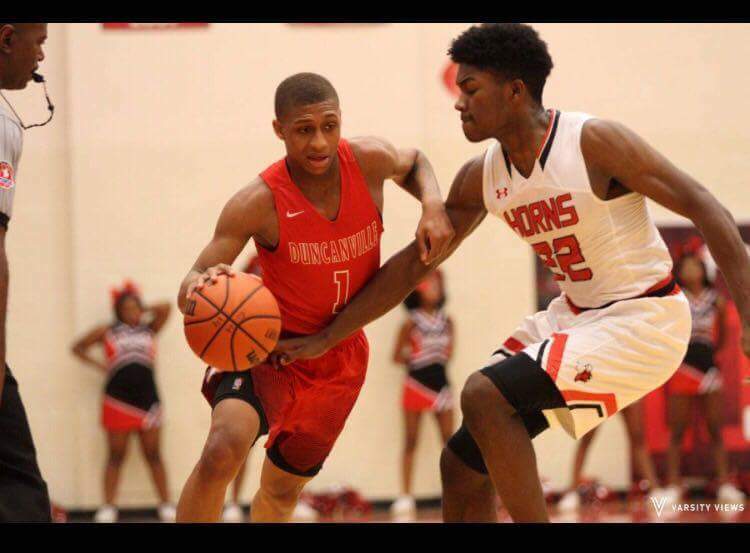 Not to mention that floor general for an upstart Duncanville team that could stage a dramatic and lengthy postseason run, a trend that, to Tyler Watkins’ credit, would in all likelihood, boost his recruiting stock. By and large, the good news is he’s still got time to make a favorable impression during what has been a rather compelling scholarship audition. That’s because for a kid who boasts lofty aspirations of playing college basketball, he doesn’t just think he can compete with and against the finest players.